Want to see puffins in Iceland? Well, we have the guide for you, and we’ll share with you all the best spots to see puffins in Iceland. Puffins can be found in all areas of Iceland, you just need to know where to look. The Atlantic puffin has become an emblematic animal of Iceland, and many visitors want to see this cute black-and-white little bird with its bright orange beak and webbed feet. Luckily, Iceland is one of the best places to see puffins as it is home to the largest colony of puffins in the world, and over half of the world’s population nest here each year. Although numbers have been sadly declining in recent years, it is estimated that over 5 million Atlantic puffins nest in Iceland each year during the spring and summer months. However, even though there are millions of these little birds in Iceland, they are not always the easiest to find. On our last trip, we were determined to see and learn about these adorable birds and do some research to find the best places to see puffins. We were in Iceland for over 3 weeks and saw hundreds and hundreds of puffins at over 10 different places in Iceland! We’ll share with you all the best places to find puffins in Iceland. We’ll tell you about 14 of the best spots, and for each one, share with you where it is, how to get there, and what to expect. 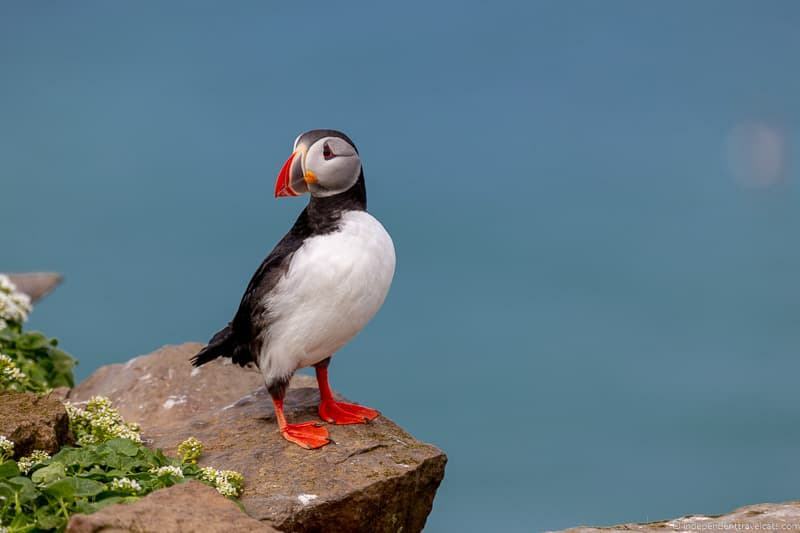 We’ll also share what tours you can take to see puffins, advice on seeing puffins in a responsible manner, and tips on getting good photos of puffins. What kind of puffins are in Iceland? When can I see puffins in Iceland? When is the best time of year to see puffins in Iceland? When is the best time of day to see puffins in Iceland? Where in Iceland can you find puffins? Can I take a tour to see puffins in Iceland? Can I see puffins in Iceland on my own without a tour? What tours can I take to see puffins? Are puffins the national bird of Iceland? Do people eat puffins in Iceland? Can I touch or hold puffins in Iceland? Where is the best place to see puffins in Iceland? Can I see puffins from Reykjavik? Can I see puffins along the Golden Circle? Can I see puffins along the South Coast of Iceland? Can I see puffins from Akureyri? What other seabirds can I see in Iceland? Atlantic puffins are birds of the auk family with penguin-like black-and-white bodies. During the nesting season puffins have their characteristic bright orange beaks and webbed feet. However, in winter, a puffin’s beak turns gray. Puffins nest in burrows in the ground near coastal areas, usually along cliffs. They will either dig the burrows themselves or re-use prior burrows or rabbit holes. They lay their eggs in the spring and they hatch in the early summer. Baby puffins are called pufflings and are a gray color. The parents will fish for the pufflings and bring back fish to the nest. Puffins eat both small fish and zooplankton. Common fish eaten by the puffin include sand eels, capelin, sand lance, herring, and hake. 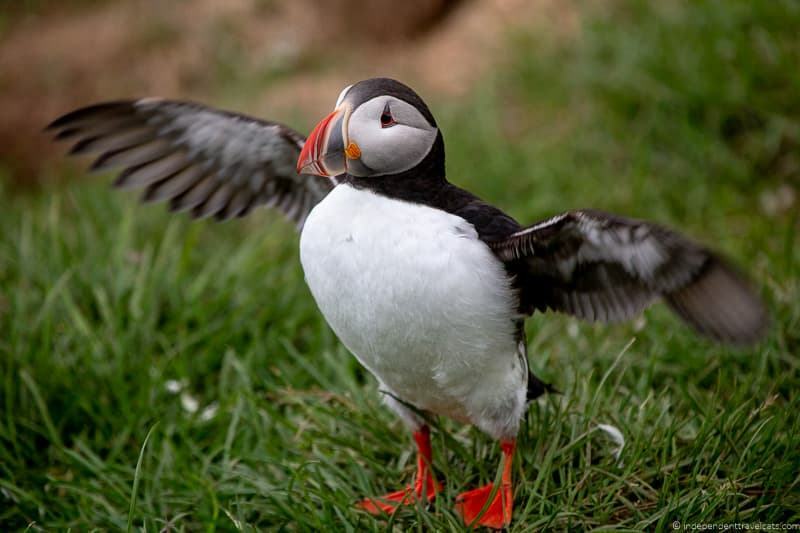 Puffins need a bit of a running start to take off and can look a bit clumsy on land. However, they are good fliers, being able to fly up to 55 mph, and fly much more quickly than you would expect. They are also very strong swimmers and can dive to fairly great depths to hunt for food. At the end of the summer, the birds leave their nesting areas. It normally takes about 1.5 months for a puffling to be ready to fledge (leave) the nest. In the autumn and winter months, puffins live in large colonies floating on the Atlantic ocean. Young puffins don’t reach sexual maturity for 4 to 5 years. For a long time, scientists knew very little about puffins outside of nesting season as they were not exactly sure where they went. Also because they lose their characteristic orange beak, they were not initially identified as puffins. The Atlantic puffin has recently classified as a vulnerable species as evidence suggests that puffin numbers have been declining over the past decade. About 60% of Atlantic puffins are believed to nest in Iceland. The Atlantic puffin (Fratercula arctica) is the species of puffin that you’ll find in Iceland. In fact, you’ll find the largest colony of Atlantic puffins in Iceland. Atlantic puffins are also known as the common puffin. Nicknames include “clowns of the sea”, “penguins of the north”, and “sea parrots”. There are three different types of puffins, and the other two are the horned puffin and the tufted puffin. Neither of these species are found in Iceland as both are native to the Pacific Ocean. Puffins typically begin to arrive in Iceland in April and leave by September. So the best time to see them is between May and August, which is the main puffin season in Iceland. 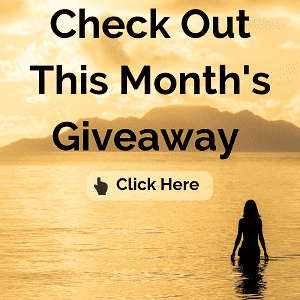 So the months of May, June, July, and August are best. Most puffins leave Iceland by mid to late August. The best time of year to see puffins in Iceland is during the late Spring and Summer, between May and August. The exact dates are going to change a bit each year and depend on the weather, but I’d recommend coming between mid-May and early August for your best chance to see them. Although you do have a chance to see puffins in April, the end of August, and early September, this is less likely. I’d call or check ahead a day or two beforehand to see if puffins are still around before booking a tour or planning a visit to a puffin site. The best time to see puffins in Iceland is in the morning (sunrise to 11am) and in the evening (6pm to sunset), especially if you are watching from land. During the afternoon, puffins are more likely to be out to sea fishing and they tend to return to their burrows in the evening. But don’t worry if you are only able to look for them in the afternoon, we saw puffins in Iceland in a number of locations in the afternoons. Once the pufflings hatch, puffins return multiple times a day to feed their them. At some locations, especially those with less human intrusions, there seems to be less variation in puffins visible throughout the day. From a boat, you can spot them bobbing in the water, fishing, and flying throughout the day. Puffins nest on islands and along the coastline in a number of places all around Iceland. You’ll find puffin colonies in North, East, West, and South Iceland. So no matter which part of Iceland you plan to visit, you can probably find an area from where you can see puffins or take a tour to see them. 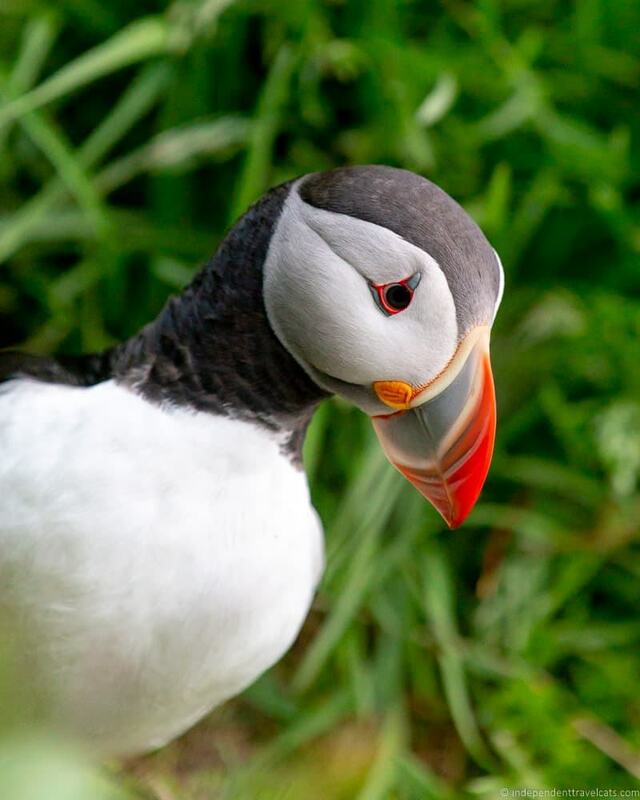 Yes, there are many tours designed to help you spot puffins in Iceland. Some are land based tours and some are boat tours. You can join a group tour or hire a private guide. If you do not have a car, joining a tour is the easiest way to get to puffin viewing sites in Iceland. We provide links to puffin watching tours later in the article. Yes, you can. There are some places in Iceland, most of which are on our list, where you often see puffins for free without needing to join a tour or book a guide. However, there are some places where you must have a guide or be on a boat tour to see a particular puffin colony. 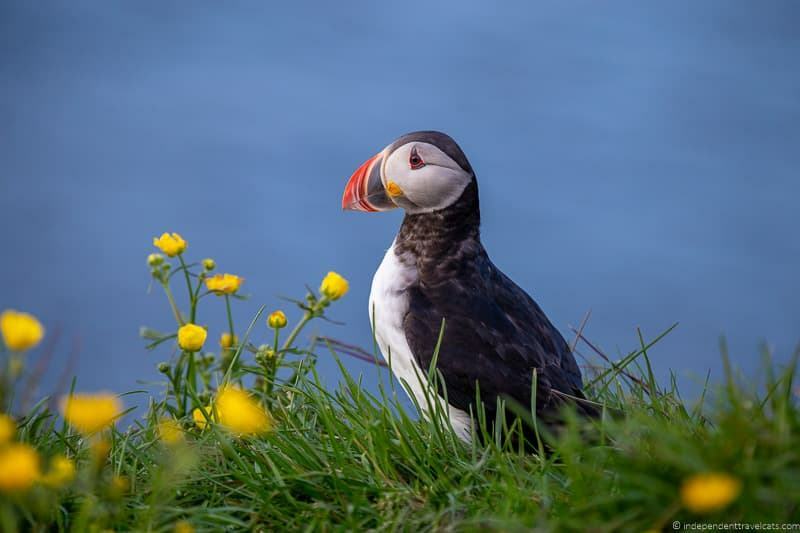 Puffin tours are popular in Iceland, and whether you are looking for a day tour or guided multi-day tour, you’ll have a number of options if you are traveling in the Spring or Summer months. Some are land-based but many are boat tours. Note that puffins are wild animals and there is never a guarantee that you’ll see puffins on a wildlife tour. However, based on our own experience, your chances are very high if you travel between May and August. We found that puffins in less disturbed areas are more likely to be viewable (e.g., ones on uninhabited islands) than ones in areas more disturbed by humans (tend to hide in burrows or be out to sea more). Taking a day tour or excursion to see puffins is a good way to see them. While you can see puffins in some areas on your own, some puffin colonies can only be seen from a boat or during a guided visit. If you are also interested in seeing whales and other sea creatures, I’d consider doing one of the longer whale and puffin tours (Reykjavík and Húsavík are two good spots). 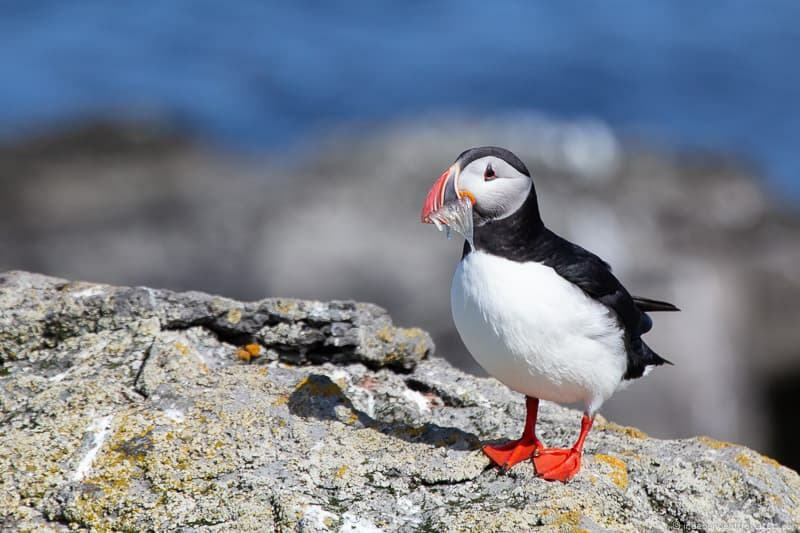 Below are a number of options to see puffins and we also list even more tour options under each of the spots for spotting puffins later in the article. But if you are looking for a tour that goes to a particular area, feel free to ask us! Grimsey Island visit & tour – An all day tour that includes ferry ride to Grimsey, a guided tour of the island, refreshments, and some free time. Leaves from Dalvik, see tour details here. Note: Some of these tours operate year-round but puffins (and most other seabirds) are only going to be seen between late April and August. Best chances are mid-May to mid-August. If you are planning to book a multi-day self-drive tour package or a guided group tour and want to see puffins, we’d recommend booking one that gives you a good opportunity to see puffins. 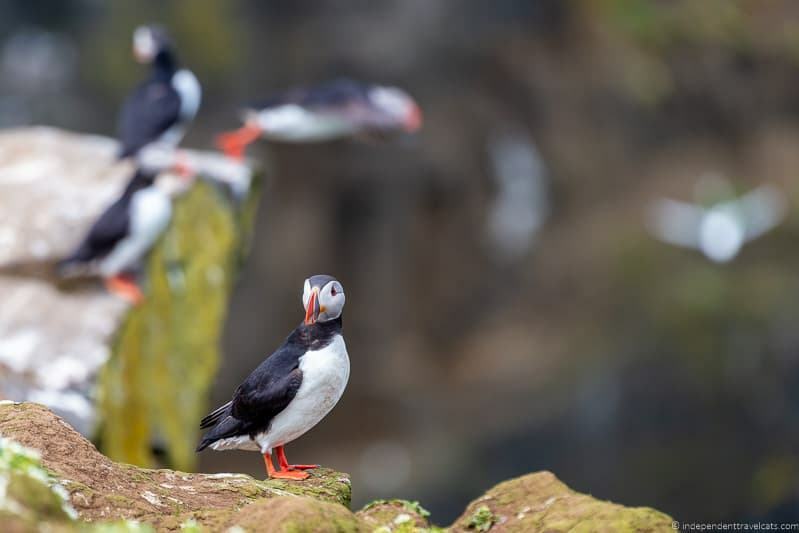 To increase your odds, we’d recommend booking one that has an itinerary that includes at least 2 places where you have a good chance to see puffins (e.g., stops at Látrabjarg cliffs and has a wildlife cruise). If you are wanting to drive yourself while in Iceland, but are wanting someone else to help handle most of the planning details and book your rental car, accommodation (you choose the budget and comfort level , and your choice of activities, a self-drive package is the way to go. For more about our experiences doing a self-drive tours you can read our Iceland planning tips, 1 week Ring Road itinerary, and 7-day Iceland itinerary article. You might also be interested in our Iceland driving tips. With a self-drive tour you have the flexibility to go to places that you really want to go and book the activities that most appeal to you. So if puffins are a must-see for you, I’d make sure the self-drive tour provides at least 2 good opportunities to see puffins in Iceland. The tour you choose is going to depend a lot on your duration, budget, and when you visit Iceland, but you can search a large selection of self-drive itineraries here and here. 7 Day Spectacular West Tour – This 7 day / 6 night self-drive trip of West Iceland includes Vigur Island, Látrabjarg cliffs, and Breidafjordur Bay. 14 day Majestic Fords Tour – This 14 day / 13 night self-drive itinerary currently includes 5 stops (or optional activities) that offer a good chance to see puffins including Dyrhólaey, Vigur Island, Látrabjarg cliffs, Breiðafjörður Bay, and Melrakkey island. 19 day Grand Tour – This 19 day / 18 night self-drive itinerary currently includes 8 stops (or optional activities) that offer a good chance to see puffins including Dyrhólaey, Borgarfjördur Eystri, Tjörnes peninsula, Vigur Island, Látrabjarg cliffs, and Breiðafjörður Bay. This is similar to the trip we did and is a great option for those who have over 2 weeks to spend in Iceland. You are almost guaranteed to see puffins! If you are planning to do a multi-day guided group tour in Iceland, check out this article about guided tours in Iceland for a great list of options to get you started. Most of these operate in the spring and summer months. Guided tours in Iceland generally include your bus transport within Iceland, accommodation, driver, English-speaking guide, some activities, and some meals (generally breakfasts). 1.) 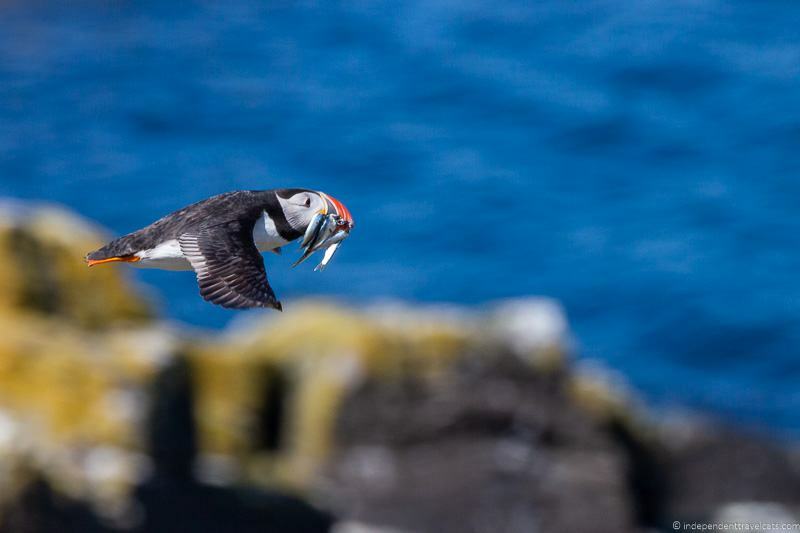 Check the itinerary to see if any of the best places to see puffins in Iceland are included (see our list later in the article). How many are included? 3.) Check whether any boat tours are included or are optional add-ons during the trip. These can be a good way to see seabirds. 4.) Does the tour description or any of the reviews mention seeing puffins or seabirds? 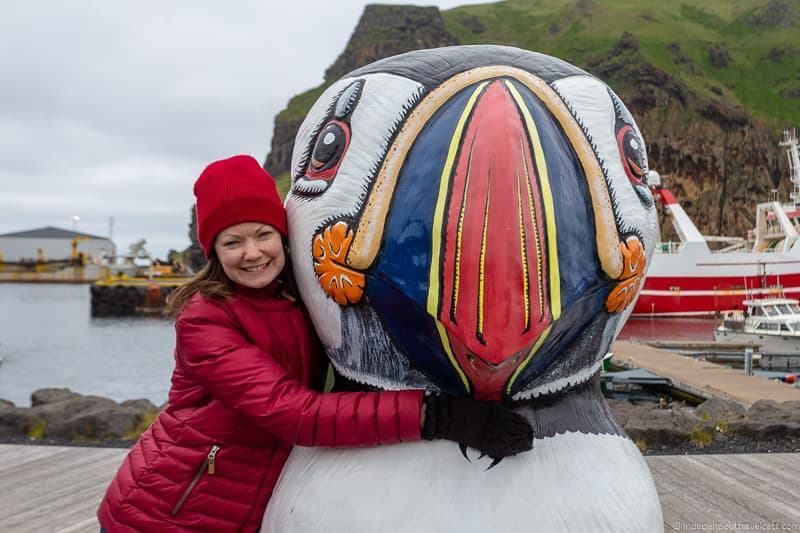 3 day Westman Islands Tour – This 3 day / 2 night unguided trip includes roundtrip airfare from Reykjavik and accommodation for a 2 night stay on the Westman Islands, home to the largest puffin colony in Iceland. This should give you plenty of time to search for puffins on land and by boat. 4 day Volcanoes & Glaciers Tour – This 4 day / 3 night guided tour itinerary currently includes stops at Dyrhólaey and an overnight stay on the Westman Islands. 6 Day Volcanoes & Glaciers Tour – This 6 day/ 5 night guided tour includes an overnight stay on the Westman Islands. 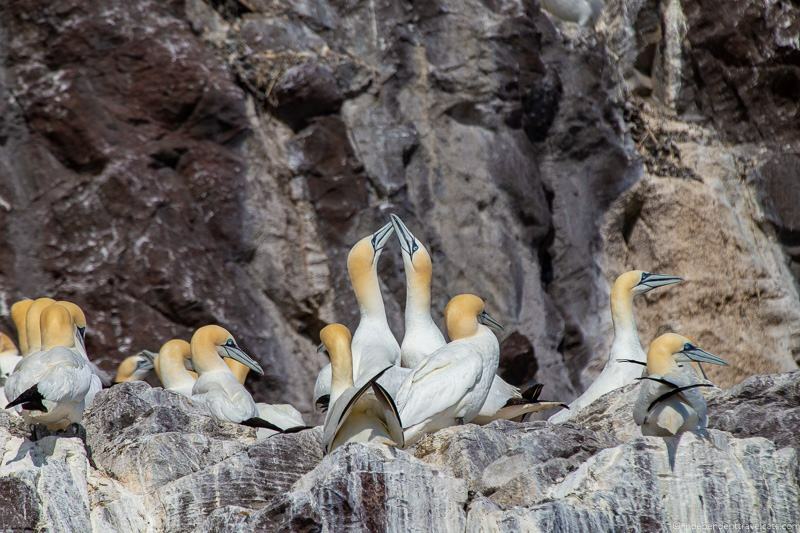 10 Day Grand Tour – This 10 day / 11 night small group guided tour includes Breiðafjörður Bay, Borgarfjörður-Eystri, Látrabjarg bird cliffs, and Dyrhólaey. Although pricey, unlike most tours, this tour includes a lot of your meals (11 breakfasts, 1 lunch, and 10 dinners) and fees. No, the national bird of Iceland is the gyrfalcon, not the puffin. Although puffins have become an unofficial symbol of Iceland. However, puffins are the bird of most interest to most visiting foreigners. Although Icelanders have long lived alongside the puffin, the strong interest by foreign visitors in seeing puffins in Iceland surprised a lot of local people. It has only been relatively recently that companies have begun creating the large number of tourist products and souvenirs related to puffins. 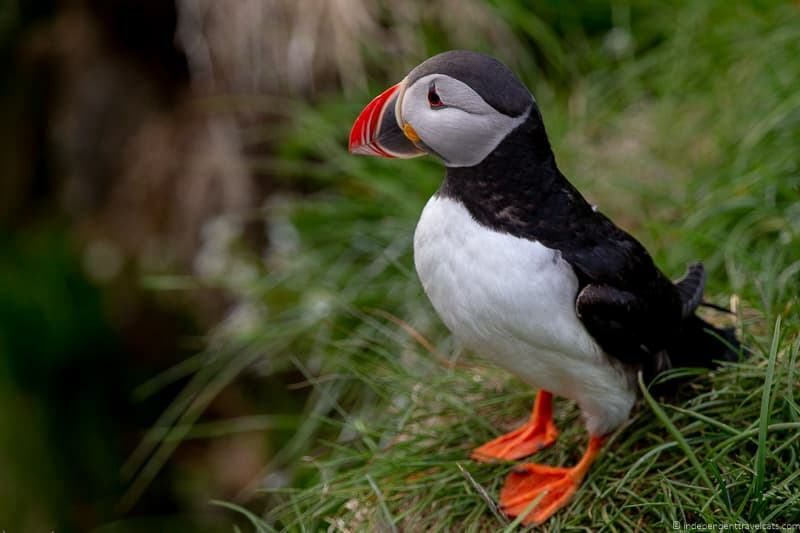 We asked a lot of Icelanders their favorite bird, and I think only one said puffin. Some favorites included the Golden plover, the raven, the guillemot, the eider duck, the white-tailed eagle, and the red-throated diver. So be sure to look out for all the other wonderful birds in Iceland as well! The least favorite bird in Iceland may be the Arctic tern as the noise and dive bombing pecks to the top of the head turn off a lot of people! Yes, some people in Iceland do eat puffins. Puffins have been a traditional meat source in Iceland for centuries and are still eaten, although its popularity has declined, especially among younger people and those concerned about the the conservation of seabirds. Puffin meat is especially popular in smaller coastal and island communities where puffin hunting still occurs. Puffin hunting and egg collecting is legal in Iceland but is regulated. There have been recent proposals to ban puffin hunting in Iceland since the Atlantic puffin was listed as a Vulnerable Species in 2015 by the International Union for Conservation of Nature. Puffins are wild animals, and you should NOT touch or attempt to touch them. Trying to touch or get too close to them will frighten them, cause them to flee or bite you (they can bite hard! ), and could lead to the death of the fledglings or young pufflings. Be respectful and give these creatures their distance! No only is it best for them, but it also means they are less likely to fly or swim away so you can get better views and photos. 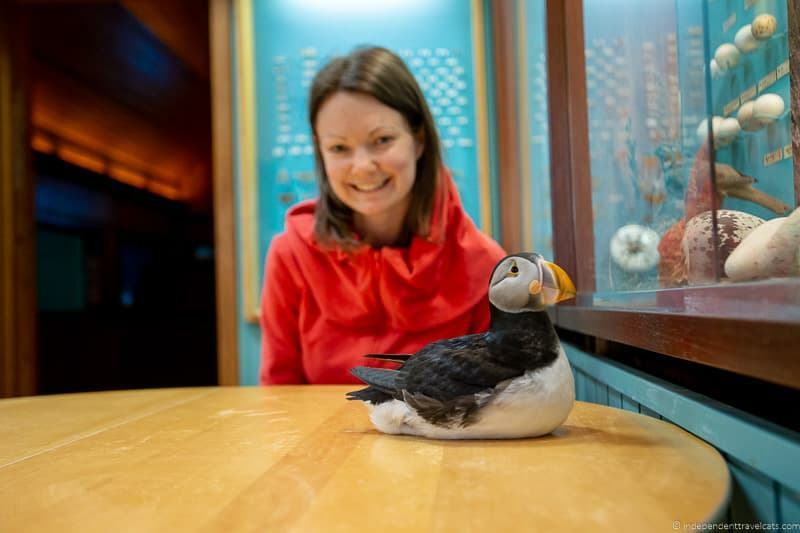 A small museum in the Westman Islands called Sæheimar (Saeheimar, Heimaey Natural History Museum and Aquarium) used to allow tourists hold and touch captive puffins. These captive puffins are puffins that were rescued and who can no longer live in the wild. However, the museum staff have thankfully since stopped this practice since they learned that excessive touching and handling puffins removes the protectant oil they need for their feathers to stay watertight when swimming. But you can still see the puffins at Sæheimar, so I’d head there if you want a chance to get really close to a puffin. Sadly, the museum’s most famous puffin Tóti died in August 2018. There are a lot of places in Iceland where you can see puffins fairly easily. We list 14 such places around Iceland. But some of the best known spots are the Westman Islands (south), Borgarfjörður Eystri (east), Grímsey (north), and Látrabjarg cliffs (Westfjords). But no matter where you are heading on your trip to Iceland, you are very likely to be relatively near a puffin nesting area that is accessible to the public. Yes, you can see puffins from Reykjavík. 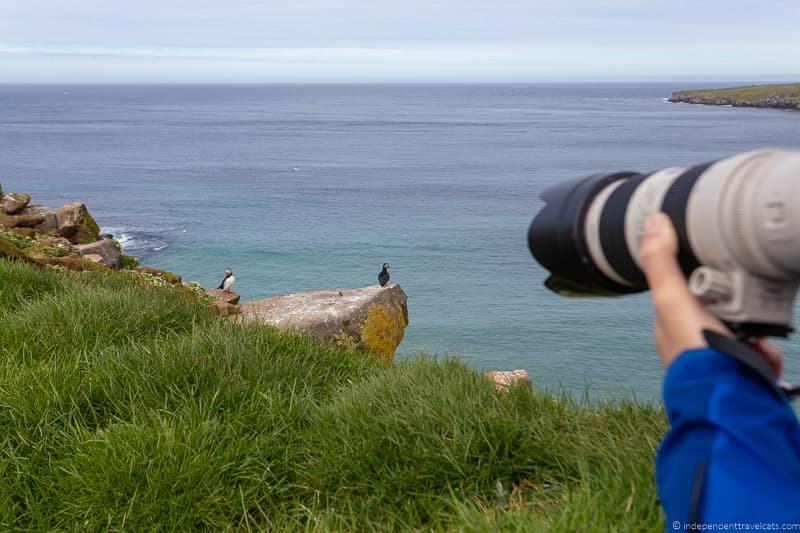 Most people think they need to go much further to see puffins, but you can see them on islands in Faxaflói bay. You can reach the islands by taking a 15 minute boat ride from Reykjavík harbor. Puffins nest on a few islands in Faxaflói bay, including Akurey and Lundey Island. Other seabirds nest here as well, including eider ducks and Arctic terns. You can view the puffins on these tiny islands by taking a Reykjavik puffin tour such as this one, from Reykjavík harbor. No, there are no puffins along the Golden Circle. The exception is if you take a boat tour from Reykjavík (see above), which is the starting and ending point for the Golden Circle. The Golden Circle is too far from the ocean for puffins to nest here. But you can see puffins nearby along the South Coast or on the Westman Islands. Yes, it is possible to see puffins along Iceland’s South Coast, including at Dyrhólaey, Ingólfshöfði, and on the Westman Islands. The Westman Islands is home to the largest colony of puffins in Iceland, and they can be seen along the cliffs, cliff tops, and by boat. At Ingólfshöfði, the puffins nest on private property, but you can take this tour to see the puffins. Note that Dyrhólaey is a protected nature area and access to the area is closed during a certain period of the puffin nesting season for in order to help protect the birds. So you may want to check the closure dates and times before your trip. Akureyri is not the best place from which to see puffins. Puffins do nest around Eyjafjörður, the longest fjord in Iceland located north of the city, so you may see some out on the water or flying if you are out in a boat. There is at least one boat tour from Akureyri where you have a chance to see puffins in the summer. If you are trying to see puffins in this area, I’d recommend heading to Húsavík (1 hour, 15 minutes away) to do a boat tour, such as this one, instead. Or going to the Tjörnes peninsula. The Atlantic puffin is not currently listed as endangered, but since 2015 it has been listed as “vulnerable” by the International Union for Conservation of Nature. This means that the group believes that it is likely that Atlantic puffin will become endangered unless circumstances change and improve. The vast majority (over 90%) of Atlantic puffins live in Europe, and Iceland is believed to be the nesting spot for over half of the world’s puffins. The number of puffins in Iceland have been declining since at least 2003, especially in the southern part of Iceland. It is believed that an estimated 8 to 10 million puffins nested in Iceland not too long ago. However, recent estimates, as noted by this article by the New York Times, are that there are currently only about 5.4 million puffins nesting in Iceland. The total European population is estimated by BirdLife International to be 4.8 million to 5.8 million breeding pairs, or between 9.6 to 11.6 million mature puffins. BirdLife International believes that the population size of puffins in Europe may decrease by 50% to 79% between 2000-2065 if the current population trends continue. There is no single reason for the decline of puffin populations, but the biggest factor is probably a decline in prey. Decline in food sources, such as the sand eel, are likely due to rises in sea temperatures, which have been attributed to climate change. The lower volume of prey means puffins have to spend more time fishing and fly further to get enough food. Scientists are seeing a decline in puffin body weights and lower chick survival rates. Other factors that are believed to negatively impact puffin numbers include overfishing, hunting, pollution, egg harvesting, extreme weather, livestock grazing, invasive predators, and tourism. You can read more about the issues facing puffins here and here. For those looking for research studies, there is a good bibliography at the end of this BirdLife datasheet. Iceland has a lot of seabird species in addition to the Atlantic puffin. These include, but are far from limited to, northern fulmars, Arctic terns, black guillemots, Manx shearwater, Iceland Gull, great skua, Brünnich’s guillemot, little auks, European shags, black-legged kittiwakes, northern gannets, great cormorants, and Arctic skua (a.ka., parasitic jaeger). If you spend time bird watching along the coast of Iceland or its islands, you will likely see a number of these species. Iceland is a great birdwatching destination and around 400 different species have been documented in Iceland. Many of these species migrate here during the Spring and Summer months. 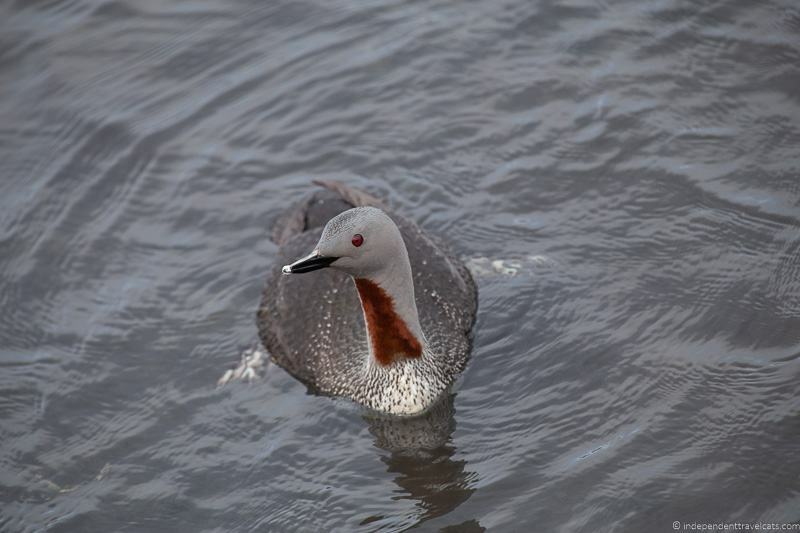 Some of the species that are often seen here include red-throated divers, great northern divers, golden plovers, white-tailed eagles, snow bunting, sandpipers, eider ducks, whooper swans, horned grebe, pink-footed geese, short-eared owls, green heron, and American wigeons. See a list of bird species in Iceland here and here. We don’t really consider ourselves birdwatchers, but we’ve seen the majority of the species we listed above during our travels in Iceland. If you plan to spend time birdwatching in Iceland, I’d consider bringing a Iceland birdwatching guide and a good-quality pair of compact binoculars with you. Keep your distance from the puffins and don’t try to touch them. Like with any wild animals, the closer you get the more your will frighten and cause stress to the birds. Use a pair of binoculars or a zoom lens so you can “get closer” without disturbing them. Stay back from cliff edges and use good judgement. Many puffins nest near steep cliffs, and the nest burrowing makes the ground loose in these areas. There are often no barriers, and it is easy to slip off in many of these areas. Respect and obey signs and warnings in the nesting areas. These are put here for your safety, the safety of the birds, and to prevent environmental damage. Stay on marked trails and paths where they exist. Use observations platforms and bird watching huts when they exist. If using a bird watching hut, be sure to leave it how you found it and read the guidelines. Some have small fees or suggest a donation, so it is a good idea to always have some small bills on you. Stay off of the puffin burrows and watch where you step as you can easily trip on the holes of their burrows. Watch for the nests of other birds. Puffins nest in burrows, but several other birds often found around puffins in Iceland make their nests directly on the ground, including Arctic terns and plovers. Be mindful of where you step and try to keep a distance from their nests. Some birds like Arctic terns can become aggressive if you are too close to their nests. As with any wild animal, you should not try to feed food to the puffins or any other seabirds. Human food is not good for them and can make them sick. Be prepared for the weather and terrain. Some of the bird watching areas can be muddy and slippery and some require longer hikes. Be sure to dress appropriately and wear sturdy shoes. Weather in Iceland can change quickly and without much warning. If you see other tourists who are harming the birds or other wildlife, try to say something to educate them about why they should not be doing that if you feel safe doing so. Overall, your goal should to cause as little impact on the birds and their environment as possible. 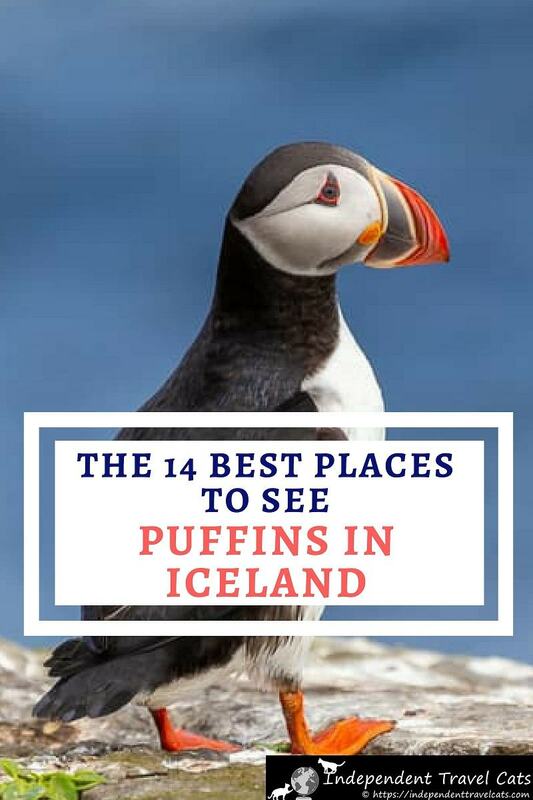 We did a lot of research and saw a lot of puffins on our summer trip to Iceland in order to compile our list of the 14 best places to see puffins in Iceland. We saw hundreds and hundreds of puffins in every corner of the country, and loved it! Puffins nest throughout Iceland so you should be able to find a spot that will work with your trip, whether you have only 1 day or 20 days to explore Iceland. 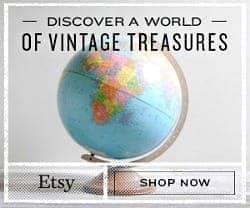 We’ve visited almost all of the places on this list, so if you have any questions as you plan your trip, just leave us a Comment in the Comments section at the end of the article. 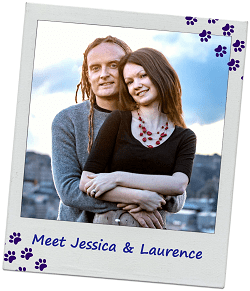 We’re happy to provide any advice or help we can give based on our own experiences and research. These are by no means the only places that puffins nest in Iceland, but some places are not accessible to the public, difficult to access, or are not reliable nesting areas from year to year. 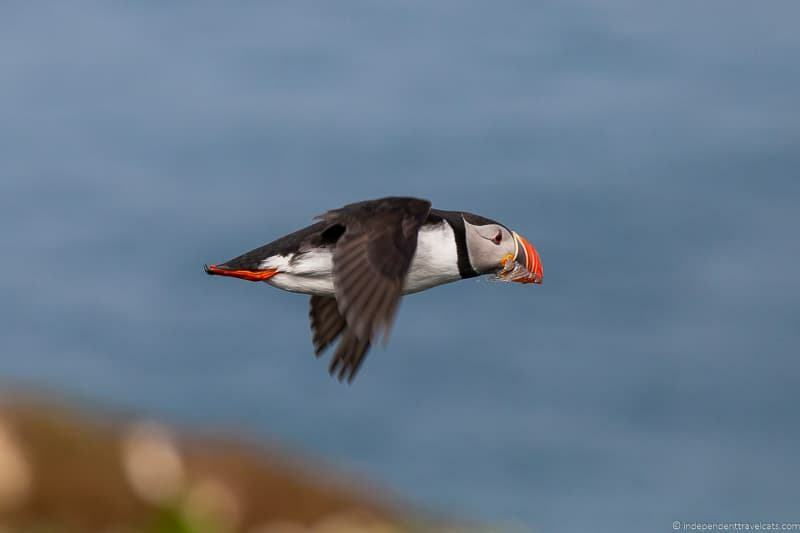 We took into consideration the number of puffins nesting in each area, public access to the area, and ease of access to the site when compiling our list. 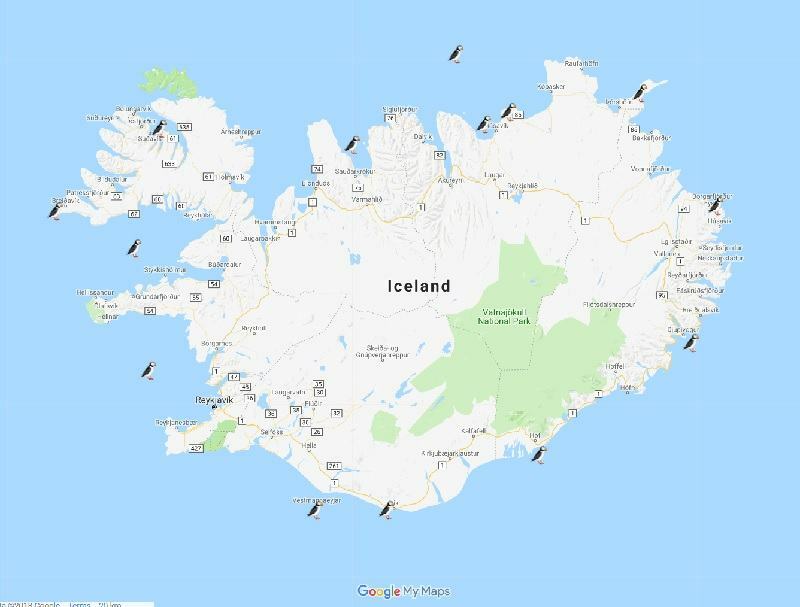 The following puffin spots are listed in geographical order starting in Reykjavík (the first place many travelers visit), and then go counterclockwise around Iceland starting along the South Coast and heading east. Reykjavík sits alongside the southern shore of Faxaflói, or Faxa Bay, and the bay is home to a wide diversity of wildlife. It is possible to see whales, porpoises, seabirds, and other sea creatures at Faxaflói. Within a fjord named Kollafjörður are tiny islands that are home to a number of Atlantic puffins. Puffins make burrows in a few of the islands in Kollafjörður, with the two primary ones being Akurey and Lundy Island (Puffin Island). These islands are uninhabited but can be seen on boat tours from Reykjavík. Most people are surprised that you can see puffins so close to the capital! Akurey will soon be granted special protection by the Icelandic Environment Agency for its seabird population. The area will become a special bird sanctuary in order to better protect the large puffin bird colony that nests each year on this small island. This is one of the few nesting areas within western and southern Iceland that has not seen a decline in its puffin population in recent years. Most of the puffin boat tours leave from the Old Harbor in Reykjavík and last between 1 to 3 hours. The boats circle Lundey Island and/or Akurey and bob around in this area usually for about 30 minutes or so to give people time to spot the puffins. The boats do not land on the little islands. You don’t get super close to them, but binoculars or a telezoom lens, will let you see them well. Most of the boat tours here include binoculars on board that guests can borrow to get a closer look at the puffins from the boat. Some shorter boat tours are just to see puffins, while others are both whale and puffins watching tours. We did this boat tour which is a 1 hour tour that is designed just to see puffins. However, you can also take a longer tour that also includes whale watching such as this tour or this one. 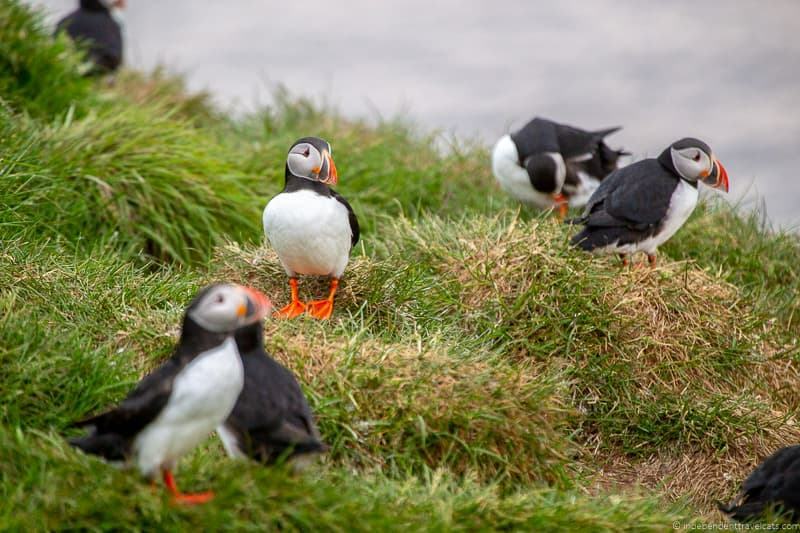 Almost all travelers to Iceland visit Reykjavík, Iceland’s capital, and a boat tour from here is the best way for those who only have a day or two in Iceland to see puffins in Iceland. puffins taking off on a “runway” on Akurey! Along Ring Road: Yes, most people start and end their trips in Reykjavík. Islands are about a 15 minute boat ride from the harbor. Free to Access: No, you need to take a boat tour to see the puffins. Guided Visit Possible: Yes, you need to take a boat tour here. Staying Overnight? There are loads of options of places to stay from hostels to apartments to luxury hotels, and you can do a search here. In Reykjavík we’ve stayed at the Grand Hotel, Guesthouse Galtafell, Reykjavik Natura Icelandair Hotel, and an Airbnb apartment. Vestmannaeyjar is an island group off the south coast of Iceland and is often referred to as the Westman Islands in English. The archipelago is made of 15 islands and 30 additional rocks or skerries. 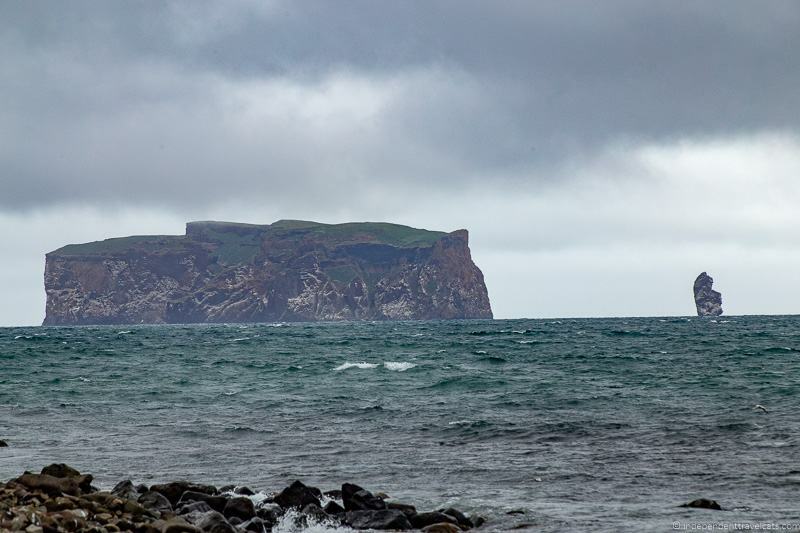 The Westman Islands is home to less than 5,000 permanent residents that live on the largest island of Heimaey. The Westman Islands are believed to have the largest Atlantic puffin colony in the world, and about 1 million puffins are believed to nest here each year. Puffins nest on a number of islands, but Heimaey is the easiest place to see them for visitors and also has the greatest number of puffins. The Westman Islands are also home to a number of other seabirds as well. Puffins can be seen on the Westman Islands by both land and by boat. So many visitors go to one of the puffin viewing spots on the island and also take a boat tour. This is what we did as well. From land, puffins nest in several grassy areas along the coastal cliffs of Heimaey. 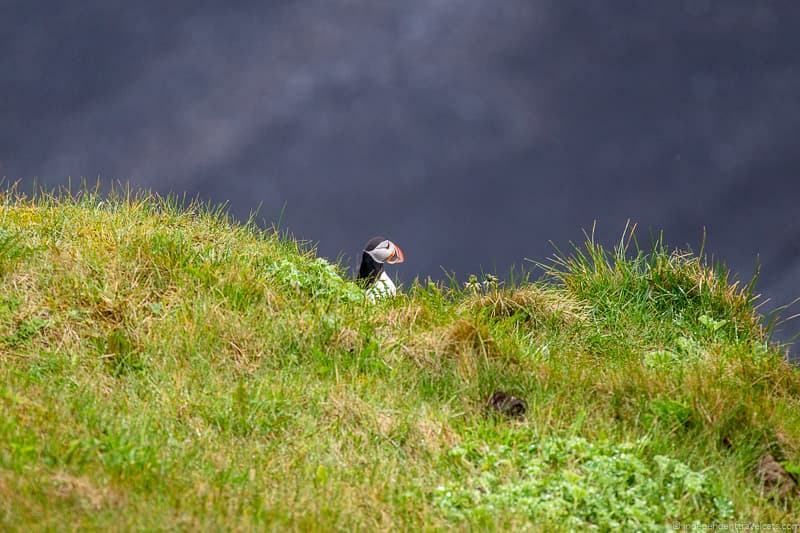 One of the best places to see puffins on the island is at Stórhöfði (Storhofdi) at the southern tip of the island, but you can often also see them around Kervíkurfjall and by hiking around the cliffs of Herjólfsdalur. The number of puffins nesting in each area changes each year, so it can be a good idea to ask around for best viewing spots. If hiking around, be sure to avoid getting too close to the cliffs or walking on or next to the bird nests. Not only do puffins nest here but a lot of other birds do as well and you could crush their eggs. 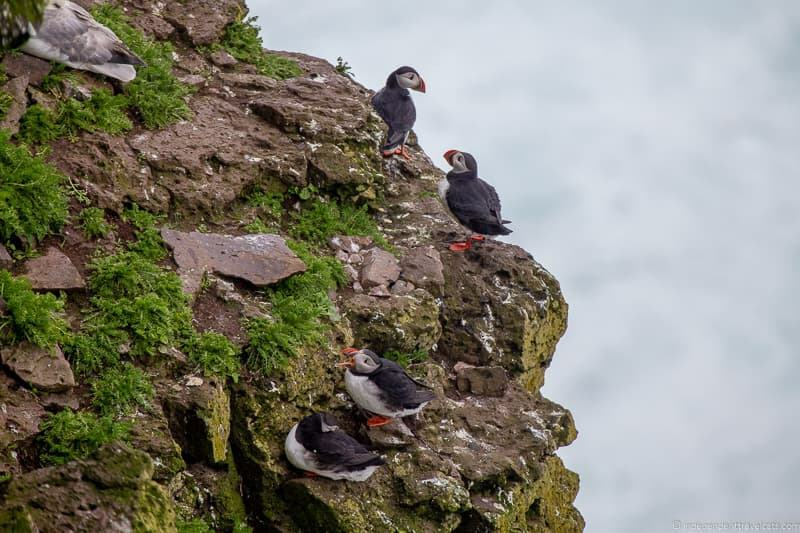 There is a birdwatching shelter at Stórhöfði which we recommend going to watch the puffins, this is a good place to watch them without disturbing them. The main puffins areas are away from the ferry terminal. You can make your way to these sites by car or long hikes, or you can take a bus tour. For instance this 2 hour bus tour takes you around to see the island’s main highlights and visits Stórhöfði for puffin viewing. There are also a few captive rescued puffins kept at Sæheimar (Heimaey Natural History Museum and Aquarium). When we visited the small museum, they had 3 puffins and one was viewable to the public when we visited. Boat trips are one of the most popular activities in the Westman Islands in the warmer months. There are several tour options out there. You can book these in advance or once on the island, but we’d recommend booking them in advance to guarantee a spot. Most tours concentrate on telling you about the history of the islands, showing you the islands various geological features from water, and spotting local birdlife. We did this boat tour that fully circles Heimaey, which included the history of the islands, seeing the lava fields and cliffs, and opportunities for birdwatching and wildlife spotting. We saw a number of puffins in the water and a few along the cliffs. But you can also do a longer and faster boat tour that takes you around several islands in a RIB boat such as this one. To reach the Westman Islands from mainland Iceland, you need to take a ferry. Most ferries in summer depart from Landeyjahöfn and arrive in Vestmannaeyjahofn (the harbor on Heimaey). Ferry rides take about 35 to 40 minutes.The ferries take both people and cars, and you can buy tickets and see the schedule here. Flights from Reykjavik and Bakki airport to Vestmannaeyjar Airport on Heimay are also possible during certain times of the year. Day trip with flight from Reykjavik – includes a round-trip flight to the islands, a 2 hour guided sightseeing bus tour, and several hours of free time with the option to do a boat tour. Day trip with ferry from Reykjavik – includes pick-up by bus in Reykjavík and transfer to ferry terminal, ferry tickets, a guided boat tour, a 2 guided hour bus tour, and return to Reykjavík. 2 night trip from Reykjavík by air – this 3 day / 2 night trip to the Westman Island includes return flight from Reykjavík, airport transfers, 2 nights of accommodation on the island, and optional activities. Nearest Town? : The nearest town on mainland Iceland is probably Ásólfsskáli but the ferry leaves from Landeyjahöfn which is closest to Hvolsvöllur. Along Ring Road? : No, short detour. The ferry terminal is located about 10 minutes off of Route 1. Then the ferry ride takes about 35 minutes. Guided Visit Possible? : Yes, guided tours by bus and boat possible. Staying overnight? A few options near the harbor and town center (all within 10 minute walk of ferry terminal) are: Hotel Eyjar (offers rooms and apartments), Hotel Vestmannaeyjar (3-star hotel, one of the nicest on island), and Puffin Nest Capsule Hostel (offers unique capsule pods in dormitory-style rooms). You can see a full list of Westman Islands accommodation here. Dyrhólaey, which means Door Hole Island, is a small grassy peninsula, and it is the southernmost point on mainland Iceland. The western upper area is called Háey (High Island) and the lower eastern area is named Lágey (Low Island). The whole area was once an island. The area is known for the Dyrhólaey lighthouse (Dyrhólaeyjarviti) which dates from 1927 and a giant black sea arch of lava. The views from both the lower and upper areas are beautiful, particularly on a clear day. During the summer, the cliffs here are an important nesting site for puffins! At Dyrhólaey, you can follow well-marked walking paths to get to the scenic viewpoints and to get closer to the area where the puffins nest. They are not too far from the parking areas and it is possible to see puffins from either the lower area or the higher area at Dyrhólaey. Just be sure to stay on the well-marked paths and avoid walking into the nesting areas to avoid disturbing the birds, environmental damage, and falling (the soil around puffin nests is normally soft). Dyrhólaey is located along Iceland’s south coast. Nearby is the Solheimasandur Plane Wreck (20 minute drive), the village of Vík (20 minute drive), and the Reynisdrangar black sand beach (24 minute drive). You can reach Dyrhólaey by car or via a guided tour. Dyrhólaey is not far from the the Ring Road (Route 1), off Route 218. Note that the road to the lower level parking lot is fairly easy to access (see it on a map here), but the higher parking lot which is located near the Dyrhólaey lighthouse (see it on a map here) requires driving up an unpaved, curvy, and narrow road. The higher road is not a F road and you can do it in a regular 2WD, but I would not make this drive in a 2WD if road conditions are bad as this is a dangerous place to get stuck. If road conditions are bad or you don’t want to take your rental car up the road, you can easily hike to the lighthouse along trails from the lower parking lot area. Dyrhólaey is a protected nature area in Iceland and access to the area is closed during a certain period of the puffin nesting season in order to help protect the puffins and other nesting birds from disturbances by both tourists and hunters. So it is a good idea to check the closure dates and times before your trip. In 2018, these were the closures implemented by the Iceland Environmental Agency (I’d expect something similar in 2019). Most of the roads and walking trails, for both the upper and lower areas, were closed from May 8th to June 25th. Both the Kirkjufjara beach here and the Reynisdrangar black sand beach a little further east are both beautiful beaches worth visiting. However, be careful when walking on the beaches here as the waves and currents are particularly strong and tourists die here every year because they underestimate the tides and the power of the waves. Along Ring Road: Short detour. Dyrhólaey is about a 15 minute detour by car from Route 1. Guided Visit Possible: Yes, many guided tours stop here. Staying Overnight? Dyrhólaey is a nature reserve and there is no lodging or camping here, but you can stay in the nearby village of Vík. Some options include Icelandair Hotel Vik (we’ve stayed here twice), Guesthouse Carina, Black Beach Suites (have lovely views), and The Barn (hostel). You can check out more lodging choices here. Ingólfshöfði (Ingólfshöfdi) is a small headland that is encircled by rocky cliffs. The area is named after one of Iceland’s first permanent settlers, Ingólfr Arnarson, who some believe spent his first winter in Iceland here. Here you can find old fishermen’s huts, a lighthouse, sand dunes, and a puffin colony. In addition to puffins, you’ll find other seabirds like razorbills, fulmars, and guillemots. Since this is private property, you need to take the Ingolfshofdi puffin tour if you want to see the puffins here. Getting to the puffins also often means crossing some water which is why part of the tour has you riding in a tractor-pulled hay cart. Tours are run by the people who own the nearby farm, and you can book the tour here. The 2.5 guided tour to Cape Ingólfshöfði includes a hay cart ride over the wet marshy area and a 1.5 hike through a nature reserve. This trip does require some hiking so may not be best for those with physical mobility difficulties. Ingólfshöfði is easy to reach and there is a check-in area for the tours just off of Route 1. This is a good option to consider if you are wanting to see puffins in Iceland along the South Coast. Along Ring Road: Yes, the check-in area is only a couple minutes from Route 1. Can Puffins be Seen from Boat: Possibly, but not aware of any boat tours offered here. Free to Access: No, this is private property, and you need to book a tour to see the puffins here. Staying Overnight? There are no options to stay at Ingólfshöfði, but within a 10 minute drive are a few options. Nearby, you can check out accommodation options in Hof and options in Hnappavellir. Papey is the largest island off the coast of eastern Iceland. Although it has been uninhabited since the 1960’s, the island is believed to have been settled by the Norse and may have been home later to Irish monks. It is currently privately owned and still has a few buildings, including Iceland’s oldest and smallest wooden church, a house, and a lighthouse. Although Papey island has no permanent human inhabitants, the island is teeming with birdlife during the Spring and Summer months, including Atlantic puffins. You can also find puffins on the island of Skrúður, off the coast of the town of Fáskrúðsfjörður; however, it is surrounded by steep cliffs and no regular boat tours pass by there. Papey is private and there is no way to visit on your own, but the island’s owner takes visitors over to Papey with his ferry boat Gísli í Papey during the summer months. The boat tour takes about 4 hours and visitors are then given a 2 hour guided tour of the island, a visit to the little church, and a chance to birdwatch and also look for other wildlife such as seals. However, as of June 2018, the owner of Papeyjarferdir has had an issue with a changed qualification regarding the size of his boat and qualifications regarding crew due to an EU regulation (Iceland is not part of the EU though). They were not able to use their boat to give tours in 2018, and the tour we were scheduled to take in June was cancelled. If you are interested in taking a boat tour to Papey, I’d contact your local accommodation (all the hotels in Djúpivogur know about the tours) or someone at East Iceland tourism to inquire about the status of the tours. We are hoping they will be able to run their tours again in 2019! The town of Djúpivogur is located just a few minutes from the Ring Road (Route 1) and makes for a great stop in East Iceland, even if you can’t take a cruise to Papey. The fishing village has a few historic buildings along the boat harbor and some quirky shops and artwork. The municipality of Djúpivogur is a top bird watching area in Iceland and you can see a number of species in this area. There are birdwatching hides (free, although donations appreciated to maintain them) located in the area to help you see some of the birds on the coastal lakes and mudflats. You can read more about birdwatching in this area here. Nearby, art and bird lovers will want to check out the giant egg sculptures, Eggin í Gleðivík, by artist Sigurdur Guðmundsson which are placed along the Gleðivík bay and represent the 34 birds which regularly nest in the area. Along Ring Road: Djúpivogur is located along Ring Road, but then must take boat ride (about 1 hour to reach island) to Papey Island. Can Puffins be Seen from Land: Yes, if you take a boat tour, you can land on the island and see them there. You can not see them from Djúpivogur. Guided Visit Possible: Yes, but check schedule ahead to see if operating. Staying Overnight? You can’t stay over on Papey Island as it is a private island with no facilities. We recommend spending the night in the nearest coastal town of Djúpivogur (where tours leave). We had a pleasant stay at Hotel Framtíð which offers rooms, apartments, and cottages, but you can check out a full list of options here. Borgarfjörður Eystri (Borgarfjordur Eystri) is a small fishing village in eastern Iceland with about 100 inhabitants. The area is named after a hill (Álfaborg) that is believed to be the home of the Queen of the Elves, and is a popular hiking spot in east Iceland. A summer music festival called Bræðslan (Braedslan) also takes place here. Borgarfjörður Eystr is also home to a large puffin colony! The Hafnarhólmi puffin colony is located on the small islet of Hafnarhólmi behind a fishing harbor called Borgarfjarðarhöfn. It is about a 5 minute drive from Borgarfjörður Eystri to reach the harbor. A small parking area is located near the harbor and it is a short walk to the staircase that takes you to the puffin viewing area. It is a relatively small area but the walkways are well maintained and you can often see puffins within a couple of meters of the walkway on land, as well as ones in the air and sea. It is free to visit the viewing area and there are placards along the walkway about the local history and seabirds that nest in the area. The walkway takes you up along an area where a number of puffins are nesting. From the very top, you can also see over to another area (you can’t access this) where you can see even more puffins from more of a distance. Just be sure to stay on the path and walkway. If you want to use the birdwatching hide located off one section of the walkway, which includes chairs, windows, and cover from wind and rain, there is a small fee (about USD $5 or equivalent in ISK, bring cash) that goes to its upkeep. But views are good from almost any area here so you likely won’t get better views from the hide. We paid to sit and watch from the hide (it’s a nice place to sit and also give money to support the upkeep), but we also got great views and photos from the walkway and platform. Note that Borgarfjörður Eystri is about a 1 hour and 15 minute drive from Egilsstaðir (Egilsstadir), the main city in East Iceland, on a secondary road. It is a significant detour from the Ring Road (Route 1). The last section of this road, about 17 miles (28 km), is unpaved gravel and in bad condition. The poor road condition is a source of frustration for local residents who want the government to improve the road and pave it. So be sure to take this into account if you decide to come here. If you do not have a car or don’t want to drive to Borgarfjörður Eystri, you can check to see if there is availability with this local bus service, or we’d recommend booking a guided tour which includes a visit here. The problem is that not many tours come here as it is such a long way off the main road. This 10 day tour is one of the few guided tours that do stop in Borgarfjörður Eystri. I could not find any day tours from Egilsstaðir (best transit hub in area), but I would contact this tour company (we’ve done a different tour with them) directly to see if you could arrange a day tour to Borgarfjörður Eystri. Along Ring Road: No, it is about a 1 hour and 15 minute detour to reach Borgarfjörður Eystri from Route 1. Can Puffins be Seen from Boat: It would be possible to see puffins in the water from a boat here, but we recommend seeing them by land at this site. Free to Access: Yes, there is a free walkway and viewing area. There is a USD $5 (or similar in ISK) fee if you want to use the covered birdwatching shelter here. Guided Visit Possible: Yes, but very limited options. Definitely recommend contacting companies or guides in advance to arrange a tour. Staying Overnight? Although accommodations are limited in Borgarfjörður Eystri (we’d definitely recommend booking in advance), it is is a great place to spend the night. You can check out lodging options here. We stayed at a nice apartment at Blábjörg Gusthouse where we had a deck with views of the water, access to indoor and outdoor spa, sauna facilities, and a restaurant. If you are camping, there is a large well-maintained campsite here near the base of Álfaborg. Langanes is a narrow peninsula near Þórshöfn (Thórshöfn) in northeastern Iceland that is shaped a bit like a goose neck. It is a fairly remote and unpopulated area that is a top birdwatching spot in Iceland. It is home to one of the largest Northern gannet colonies in Iceland and you can also find puffins nesting here as well. Langanes is a well-known area to avid birders in Iceland, but is relatively unknown to tourists and draws fewer people than many of the other spots on this list. 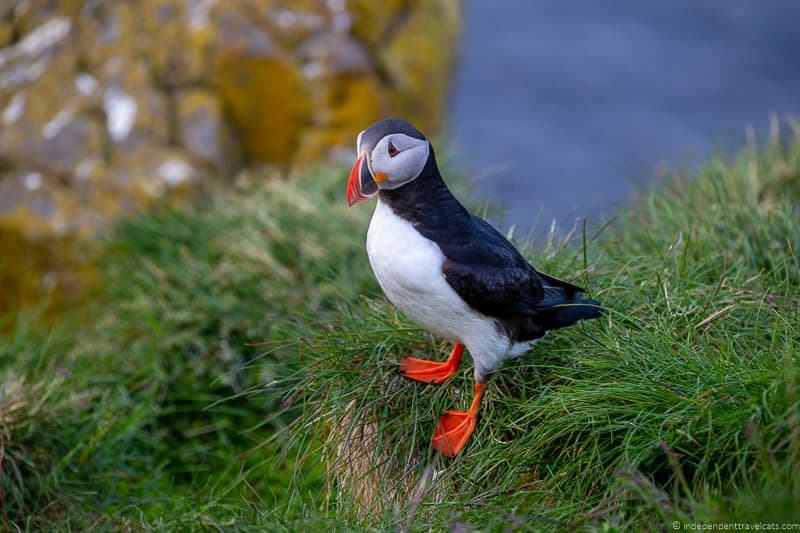 It is also not well-known for puffins although it is fairly easy in the summer months to spot them here, both on the cliffs of Skoruvík and the tip of the peninsula at Fontur near the lighthouse. A highlight here is the bird watching platform over Skoruvíkurbjarg, Stori Karl cliff, where it is possible to see Brünnich’s guillemots and Northern gannets on the Stóri Karl rock column. Other seabirds, including kittiwakes, gulls, and puffins can also be seen here, but the stars here are definitely the gannets and guillemots. If you are driving the Ring Road, Langanes is a significant detour so keep that in mind when deciding to come here. Note that the road becomes pretty rough, especially as you get towards the end of the peninsula near Fontur here the lighthouse is located. While you do have a decent chance to see puffins here, they are not the star species here. So I’d only come if you are interested in seeing other seabirds as Skoruvíkurbjarg is probably the best place to see gannets on mainland Iceland. This area is fairly remote and lesser traveled. One of the few areas on this list you might consider a hidden gem in Iceland and a good place to hideaway if you need an escape from the crowds. Also in this general area to the west is Raufarhöfn which has a very cool gigantic Stongehenge like monument called the Arctic Henge. Also nearby is Rifstangi, which is the northernmost point in mainland Iceland. There are some great birdwatching spots up here as well, especially around Melrakkaslétta, although you won’t see puffins here. If you don’t have a car, transport options and guided tour options are very limited, especially getting out to the observation areas. You can get to Þórshöfn by bus though. To get to the observation areas, your best option is to arrange a Land Rover tour with Ytra Lón Farm Lodge who do local tours that included birdwatching tours. They take people from their farm (where you can also spend the night), but can also arrange to pick you up in Þórshöfn as well. Along Ring Road: No, it is about a 1 hour and 30 minute detour to reach Þórshöfn from Route 1, and then another 50 minutes to reach the Stóri Karl observation platform. Can Puffins be Seen from Boat: It is probably possible to see puffins and other seabirds in the water from a boat here, but we recommend seeing them from land. Not aware of any boat tours here. Guided Visit Possible: Yes, but very limited options. Definitely recommend arranging your tour in advance. Staying Overnight? Lodging is limited on the peninsula so we recommend booking in advance. The closes place is to spend the night in Þórshöfn. We recommend checking out Ytra Lón Farm Lodge (6 miles from the city center) if you are looking for a quiet rural stay and the owners can arrange local tours. Another option is to stay in Raufarhöfn (about 55 minutes from Þórshöfn). We had a pleasant stay at Raufarhöfn Hótel Norðurljós (Hotel Northern Lights), the staff here were really friendly and helpful. The stubby peninsula of Tjörnes is located in northern Iceland, just west of Húsavík. The area is best known for its geological formations, which are best seen by looking at the cliffs, where you can see layers and layers of fossils that date back about 2 million years, and at Tungulending beach. However, the peninsula is also know for its birds, particularly rock ptarmigan and puffins. It can be hard to spot the puffins at some spots, but they tend to nest on the eastern side of the peninsula. Two spots we recommend are Voladalstorfa near the lighthouse on the tip and Hringsbjar, a tall cliff on the east side of the Tjörnes peninsula. The viewing platform at Hringsbjarg is probably the most popular spot. There are no railings or trails on some parts of the peninsula, so be careful and stay away from the cliff edges. Also note that this area is an important nature reserve and the fossils and nature here are all protected by Icelandic law. Be sure to not disturb or take anything you see here. There are few services on the peninsula but you will find a seasonal cafe (open late spring and summer to public) near Tungulending beach. They serve snacks, cakes, coffee, and drinks. You can also spend the night at the guesthouse here year-round. The Tjörnes peninsula is not on the Ring Road and is about an hour drive away. The peninsula is about a 16 minute drive from Húsavík. It is a pretty quiet part of Iceland relative to many other areas. If you want to visit Tjörnes as part of a day tour, you can visit as part of a Diamond Circle tour from Akureyri, or even as a day tour with flights from Reykjavik. Along Ring Road: No, it is about a 1 hour detour from Route 1. A bit further to the eastern cliffs. Can Puffins be Seen from Boat: It is possible to see puffins and other seabirds in the water here, but we recommend seeing them from land. We are not aware of any boat tours here. Guided Visit Possible: Yes, but limited options. We recommend arranging your tour in advance. Staying Overnight? If you want to stay on the peninsula, we recommend checking out this guesthouse, which has nice views out to sea and the owners can provide meals. For more options nearby, we’d recommend spending the night in Húsavík, and you can see a list of accommodation options here. Húsavík is known as the whale capital in Iceland as several whale species regularly come into Skjálfandi Bay and the surrounding waters in this area. It is considered the best place to go whale watching in Iceland, and the town is a popular stop for travelers visiting north Iceland. It is also home to the Whale Museum, which is a good place to learn more about these giant creatures. Although best known for whales and fishing, Skjálfandi Bay is also home to a large number of bird species, including Atlantic puffins, fulmars, geese, guillemots, ducks, kittiwakes, herring gulls, and skuas. It is estimated that about 100,000 pairs of puffins nest in and around Skjálfandi Bay. The main island that puffins nest on in the bay is called Lundey, or Puffin Island. This is the island that most boat tours will circle when you go searching for puffins. However, further away is Flatey Island which is also home to nesting puffins in the summer. Húsavík is located in northern Iceland and is about a 30 to 40 minute detour from the Ring Road. It is easy to reach by bus and is a common stop on guided bus tours. Whale watching tours are often included in multi-day guided tours that stop in Húsavík, but the tour may or may not include getting close to Lundey Island. You need to take a boat tour to see the puffins on Lundey Island. Tours do not land on Lundey, but you can see the puffins from the boat. Most boat tours that go to Lundey have binoculars on board to help see the puffins closer up. Most puffin boat tours are a combined whale watching and bird watching tour, such as this traditional boat tour and this RIB boat tour. 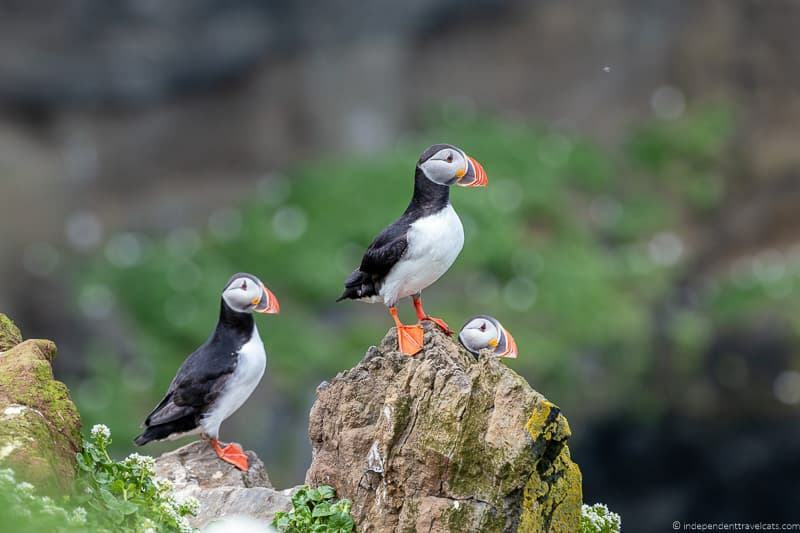 You can also do a boat tour to see the puffins at Flatey Island, but tours to the island are infrequent so you will want to plan ahead if you want to go there. Flatey Island has no permanent residents but is a summertime home for several families who maintain summer homes here. About 30 species of birds nest here, including puffins. The only operator we know that goes to Flatey Island on any regular basis is Gentle Giants, and tours leave from Húsavik and normally take about 5 hours. These tours include a return boat trip and a guided tour of the island. Private tours are sometimes possible with prior arrangements. Along Ring Road: No, it is about a 35 minute detour from the Ring Road to get to Húsavík, and then you need to take a boat tour to see puffins in Skjálfandi Bay. Can Puffins be Seen from Land: Yes. You can’t see any puffins from Húsavík or land on Lundey, but you can land on Flatey Island and see them from land there. Free to Access: No, you need to take a boat tour. Guided Visit Possible: Yes, boat tours are available to both Lundey Island and Flatey Island. Staying Overnight? If you plan to stay overnight in Húsavík, you have a number of lodging options, including hotels, guesthouses, apartments, and hostels. You can see a list of accommodation options here. Grímsey is the northernmost inhabited island in Iceland, although the small rapidly eroding Kolbeinsey is actually the most northernmost point in Iceland. The Arctic Circle currently passes through the island so you “can cross” the Arctic Circle on the island. Grímsey is a haven for a number of seabirds, including Atlantic puffins. Puffins have long nested here and have been a source of food on the island for centuries. The small island has less than 100 residents. The main industries here are fishing and tourism, and it was interesting to meet some of the local people and learn about life on the island. Everyone knows everyone! Birds nest all around Grímsey and you can see puffins nesting in a number of places and we actually saw some within a 5 minute walk of the ferry terminal. But the larger colonies are on the edges along the western side of the island (same side the ferry arrives into). There is a helpful sign once you start walking up the road from the ferry to help you find the church, Arctic Circle monument, restaurant, birds, etc. Just follow the main road north until you reach water on the other side and you should find the puffins. You can get close to the puffins here, and we had a great time just sitting and watching them come and go. There are no trails and no barriers along much of the cliffs so just be sure to stay away from the edges to avoid falling or damaging the nesting areas. The ground is very loose in some areas. Also be careful where you tread as birds like plovers and Arctic terns lay their eggs on nests directly on top of the ground. The island has a large colony of noisy Arctic terns, which can be vicious when trying to protect their nests. Try to stay away from their nesting areas to avoid disturbing them too much. It is a good idea to cover your head when walking past them to avoid being bite if they attack. Covering your head with a hat or hood, or holding up a stick (they will attack the stick) will usually do the trick. Grímsey is small and you can walk from one end of the island to the other in less than 1 hour. In addition to checking out the puffins and other nesting birds, the main things of interest are a small wooden church, Arctic Circle markers, a small art gallery, and the lighthouse. You can easily explore the island in a few hours on foot. Restaurant Krían is a good place to stop for hot drinks, sandwiches, and soup. Grímsey Island can be reached by ferry or by taking a small plane. However, the ferries and flights are not daily, so you will want to check the schedule and make plans accordingly. The ferry leaves from Dalvik and takes about 3 hours to reach Grímsey. So if you go by ferry, it will be a full day trip, or you can arrange in advance to stay overnight on the island. We went over by ferry and left at 9:00am and arrived back in Dalvík at 7:00pm. You can check the ferry schedule here. It is a long ride so it is a good idea to bring something to do or read with you. The ferry ride was fine for us and they played American films during much of the voyage which kept us occupied. However, part of the crossing to the island was made unpleasant because of the large number of people vomiting. We did not get seasick but several people on the boat did and listening to people vomit into bags an enclosed space was not pleasant. If you are short on time (or afraid of getting seasick), you can go by plane. The flight is about 30 minutes from Akureyri. This 3 hour flightseeing tour includes round-trip flights, crossing the Arctic Circle, and 2 hours exploring the island. Total trip is about 3 hours. You can explore the island on your own or you can arrange a guided tour in advance. This summer tour includes your ferry ride, a guided tour of the island, and light refreshments. The tours on the island are run by a local woman named Halla and her family, who will take you to all the highlights and share the local history. We did a tour with Halla’s daughter Una and really enjoyed it as we learned a lot more about the history, people, and local life. We visited the church, lighthouse, Arctic Circle monument, and spent some time birdwatching. It was a good addition to our free time. It is also possible to arrange private boat trips, fishing trips, and even the chance to go snorkeling or diving on Grimsey Island. If you go Arctic snorkeling or diving, you have a good chance of seeing puffins swimming and diving in the water. 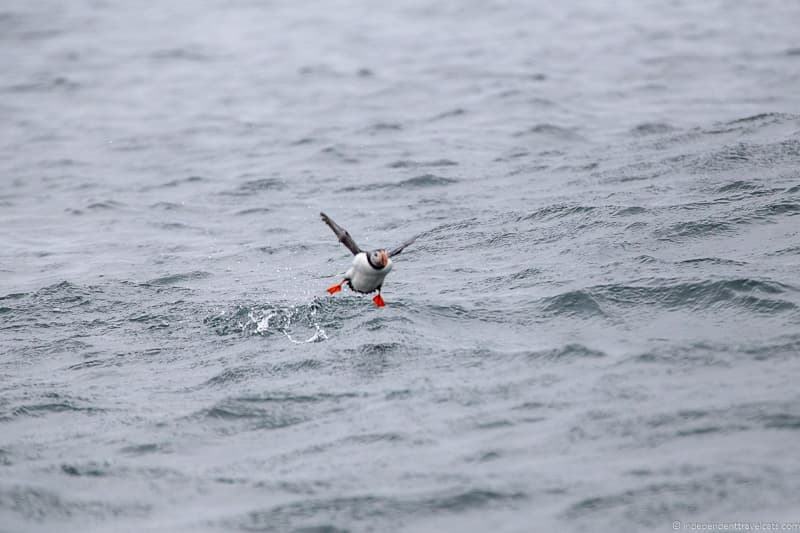 The chance to see puffins diving underwater is a unique offering! Nearest Town: The closest town on the mainland is probably Húsavík, but the ferry leaves from Dalvík. Along Ring Road: No, it is about a 25 minute detour to reach Dalvík from Route 1, and then a 3 hour ferry ride. Or you can take a 30 minute flight from Akureyri which is on the Ring Road. Free to Access: Yes, although you need to take a ferry or flight to reach the island. Staying Overnight? Staying overnight can be a great way to really explore the island. The accommodation on Grímsey is limited, seasonal, and basic. There are two main guesthouses on the island:Guesthouse Basar and Gullsól guesthouse. There is also the Sveinsstaðir Home Stay, and you can email Halla (halla@arctictrip.is) for more information and to arrange a booking. Drangey, or Drang Isle, is an island in the Skagafjörður fjord in northern Iceland. In the Icelandic Sagas, Drangey Island is best known as a hiding place of outlaw Grettir Ásmundarson and the place of his death (he was assassinated by sorcery!). The island was also used by local people for sheep grazing, egg collecting, and bird hunting. The island is uninhabited but is a popular nesting spot for seabirds in the spring and summer months. Puffins are one of the most common, but other seabirds that nest here include guillemots, kittiwakes, fulmar, shearwaters, and little auks. A couple of locals started a family-owned company called Drangey Tours to give seasonal tours of Drangey Island. The boat tours depart from Reykir Harbor, near Grettislaug (local outdoor thermal pool), about 25 miles north of the town of Sauðárkrókur. The company offers two tours focused on birdwatching, a 3.5 hour boat tour that includes 2 hours on the island, and a 1.5 hour tour that just circles the island. They also offer a third sea angling tour. You can see the tours here. 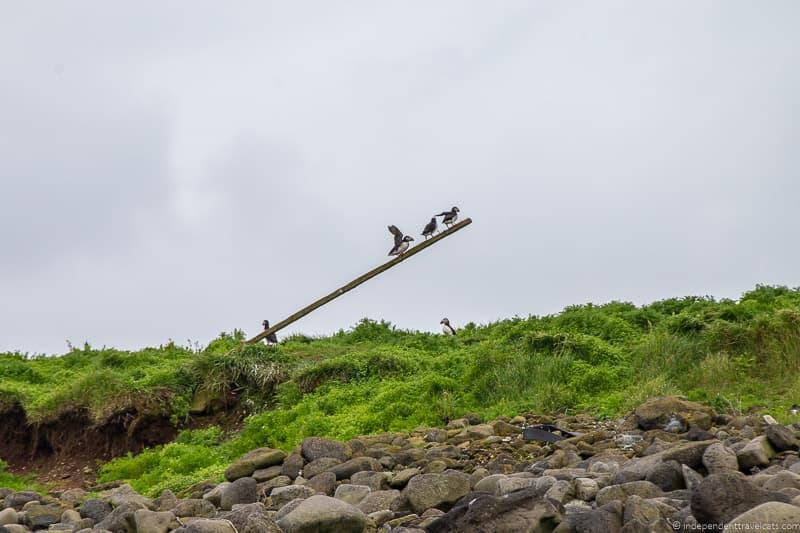 The reason that Drangey Tours offers two types of boat tours is that it requires a steep climb to access the island and the area where most of the seabirds nest. Drangey looks like a rock fortress and is surrounded by steep cliffs on all sides. The climb from the boat requires one to climb up a steep ladder and path, that can be slippery, to get on and off the island. The family who runs Drangey Tours have constructed paths and steps on the island, and they have also built a small hut. During the visit, the guide shares stories about the history of the island and area, tales from the Icelandic sagas, and information about the birdlife. You have free time to explore, and puffins are usually easy to spot near the cliffs here. If you do this tour, be prepared. Be sure to wear comfortable clothing that you can hike and climb in as well as sturdy shoes or boots. Have places (e.g., zipped pockets or backpack) to safely stow any gear or valuables when getting on and off the boat. Visiting Drangey is a great option for adventure travelers and those in decent physical shape who want to see puffins in Iceland. However, it is probably not a great fit for young children, those who are fearful of heights, or anyone with physical restrictions or reduced mobility. However, if you don’t want to do the hike on the island and still want to get up close to Drangey, you can still take a 1.5 hour boat tour. The tour circles the island so you can birdwatch from the boat, and then you can stay on the boat or explore the small harbor at Drangey Island. The boat harbor is about 50 minutes from the Ring Road. If you do not have a car, you can get to Sauðárkrókur by bus. From Sauðárkrókur, you would need to arrange private transport to get to the boat harbor. Along Ring Road: No, it is about a 50 minute drive from Route 1. Free to Access: No, you need to book a tour to visit the island. Staying Overnight? There is a campsite located next to Grettislaug (the thermal pool not far from the boat departure point), and you’ll find several lodging options in Sauðárkrókur. Vigur Island, also known as Paradise Island, is a small privately owned island situated in Ísafjarðardúp in the Westfjords. Only one family lives here permanently and they earn a living from farming, down collection, and tourism. The island is home to a number of nesting birds, including puffins, eider ducks, guillemots, and Arctic terns. Regular boat tours from Ísafjörður bring tourists to Vigur Island for a visit. The boat ride takes about 30 to 40 minutes and then you then have about 2 hours on the island. The boat tours from Isafjörður include a guided walk, coffee and some delicious desserts, a visit to the farmhouse, and some information about ethical eider duck processing. You get to see the farm, the wooden windmill, an old rowboat, and a chance to send a postcard from the smallest post office in Iceland. There’s also a small gift shop. If you are interested in learning more about ethical Icelandic eider duck down and where to buy products made from the local down, ask the folks here and they can give you suggestions. We really enjoyed our trip to Vigur Island. The boat ride was pleasant, our guide was knowledgeable, and it was a really beautiful place. In addition to birds, we also saw seals here. Also the “snack” was much more than we expected with several homemade breads, cakes, and desserts on offer. In addition to birds, we also saw seals here. We were impressed by the set walking pathways and concern for the wildlife on the island. Animals seemed less scared of people here because of the set boundaries for visitors. For instance we saw eider ducks nesting right next to the path, a curious guillemot peeking through the windows of the dining area, and seals lying closer to us than we’ve seen anywhere else in Iceland. The beautiful island is actually currently up for sale, so if you really love the island, you can buy it! Note that Isafjörður is far from Route 1, and you’ll need time to be able visit to the Westfjords. Driving to Isafjörður will take at least 4.5 hours from the Ring Road. But this is a great puffin spotting opportunity for those who already plan to spend some time exploring the Westfjords. Along Ring Road: No, it takes over 4 hours to reach Isafjördur from Route 1, and then you need to take a 35 minute boat ride to reach Vigur Island. Free to Access: No, you have to take the guided boat tour to visit. Staying Overnight? There is no offered guest accommodation on Vigur Island at this time. However, there are several lodging options in Isafjördur, and we stayed at the 3-star Hotel Ísafjörður. The Látrabjarg cliffs, located in the Westfjords, are the largest bird cliffs in Europe. They are about 8.6 miles (14 km) long and up to 0.27 miles (440m) high! The cliffs play host to millions of birds each year. The cliffs are a very important nesting areas for a number of seabird species, including the razorbill and the puffin. There is a parking area here and then it is easy to follow the trail and steps that leads up closer to the cliffs. Be careful as there are few barriers here and mind the warnings and signs. These are put here both for your safety and to protect the nesting birds. Environmental volunteers were there when we visited and were busy marking off nesting spots areas, putting up signs, and repairing steps and the walkway. You can often get pretty close to puffins here (just don’t get too close) and you’ll see puffins sitting on the edge of the grassy cliffs. During our visit, the weather was rainy and it was also very very windy, so many of the puffins were sensibly hiding in burrows, out to sea, or standing along the sheltered cliff ledges. In addition to spotting birds here, it is also a great area for hiking and you can walk for miles here along the cliffs. In addition to birds, you may also spot Arctic foxes, we saw two while hiking here. The area is fairly remote, and the Bjargtangar lighthouse nearby marks the westernmost point in Europe. The rural roads in this area become gravel and are not in great shape; however, if the weather is decent, a regular 2WD car can make this drive. Note that some local people are not especially happy about the increased number of tourists in this area that already has limited infrastrure for residents. We saw signs saying as much when we last visited, and also heard some rumors about locals wanting to get rid of the puffins at the cliffs so tourists would not come here. I am not sure if this is true or not, but be sure to be a respectful visitor here! If you are looking for a guided day trip to the Látrabjarg cliffs, or just want to avoid driving your rental car here, this tour to Látrabjarg includes bus transport from Patreksfjordur, a visit to the bird cliffs with lots of free time, a guided hike, and a stop at the Heritage Museum at Hnjotur. If you don’t have a car, you can’t reach this area by public transport, but it is possible to get a bus to Patreksfjörður from Reykjavik via Brjánslækur in the summer. You can see the bus schedule here. From Patreksfjörður, you can then take a bus tour. Other options include booking a multi-day tour that stops at the Látrabjarg cliffs or hiring a private guide. Along Ring Road: No, it takes about 4.5 hours to reach the Látrabjarg cliffs from Route 1. Can take longer depending on condition of roads. Staying Overnight? There is no offered guest accommodation at the Látrabjarg cliffs. The nearest town is Breiðavík, and you can see lodging options here. There are also campsites and facilities offered at Hotel Breiðavík. If you’re looking for more options, the largest town in the area is Patreksfjörður and it is about a 1.5 hour drive away from the cliffs. You can check out hotels here; we have stayed at Hotel West. Breiðafjörður (Breidafjordur) is a large shallow bay, or fjord, with many islands and islets. Breiðafjörður is ringed by mountains and is bordered the Westfjords along the north and the Snæfellsnes Peninsula to the south. Some of the islands are home to nesting birds during the summer months, including puffins. Islands with birdlife include Flatey Island and Melrakkey Island. The vast majority of the islands in Breiðafjörður are uninhabited or are only used for summer residents. Although there are a few permanent residents, notably on Flatey. Flatey Island is the island in the bay most visited by tourists as it has several colorful old houses, a church, a library, and nesting birds. There is also a seasonal hotel and café. You can get a ferry to Flatey in summer from from Stykkishólmur (Snaefellsness Peninsula) or Brjánslækur (Westfjords), and you can check the ferry schedule here. You can see the island from the ferry or stop and explore the island. You can also take this Viking sushi boat tour of the bay from Stykkishólmur. Melrakkey Island, “Fox Island”, is a small uninhabited island just off the coast of the small town of Grundarfjörður on the Snæfellsnes Peninsula. Historically, it was used for as a place for fishing, bird hunting, and farming. Because of its birdlife, Melrakkaey is protected, and only those with permission from the Nature Conservation Agency may visit. However, you can take a boat ride around the island to see the puffins and other seabirds, and a boat trip here also provides stunning views of Grundarfjörður and Kirkjufell Mountain. 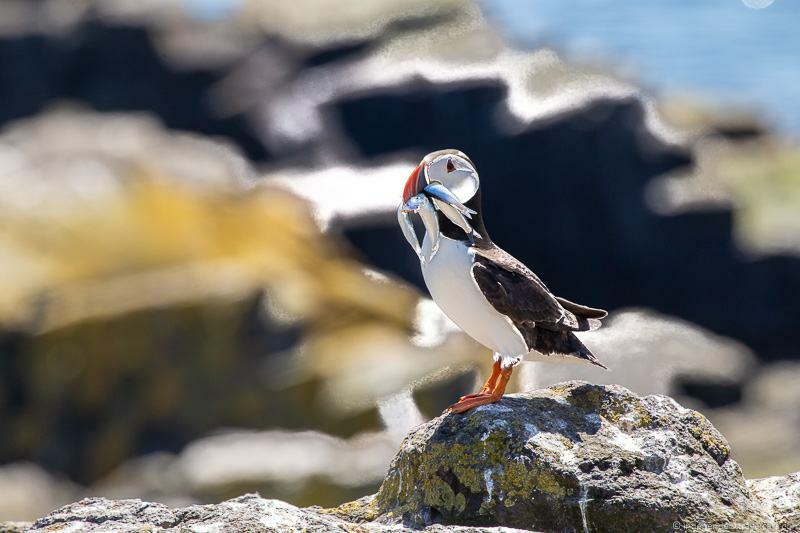 Although you may be most interested in seeing puffins, Breiðafjörður is a great birdwatching area and there is a chance to see a number of species who nest on the many islands and rocks here, as well as those who live in the nearby coastal area. You also have the chance to see seals, whales, dolphins, and porpoises in the bay. It takes about 1.5 to 2 hours to reach Stykkishólmur or Grundarfjörður from Route 1, but a good option if you are already planning to visiting the Snaefellsnes Peninsula. If you don’t have a car, you can get a public bus to Stykkishólmur and then take a ferry to Flatey or book a guided boat tour. Along Ring Road: No, it takes about 1 hour and 40 minutes to reach Stykkishólmur or Grundarfjörður from Route 1. Or 3 hours from Route 1 to reach Brjánslækur in the Westfjords. Can Puffins be Seen from Land: Yes, on Flatey Island. Free to Access: Yes, but you need to take the ferry or a boat tour. Staying Overnight? This is a large area, but you may want to stay near where you plan to take the ferry or boat tour if you plan to explore Breiðafjörður by boat. There is one seasonal hotel on Flatey Island, called Flatey Hotel. The town with the most accommodation is going to be Stykkishólmur, and you can look at options here. Other towns that may be a good fit are Grundarfjörður (check lodging options here) and Brjánslækur (check lodging options here).We actually stayed alongside the coast of Breiðafjörður at this wonderful country hotel, which we loved, but it is may be a bit remote and too far for some. It is about a 2 hour drive from Stykkishólmur. Puffins are cute, and they photograph well with their black-and-white bodies and bright orange beaks and feet. You don’t need a fancy camera to get a good photo. But if you are looking for a new camera before your trip, you can check out our travel camera guide, as well as our recommendations for the best compact cameras and mirrorless cameras for travel. Bring a telezoom lens or camera with a zoom, we recommend a zoom of at least 300mm. If you think you need a new lens, check out our travel lens guide for ideas. If you are bringing along new camera gear, be sure to test it and know how to use it BEFORE you get to Iceland. We saw many people fiddling with cameras they didn’t know how to properly use in Iceland. You don’t want to be figuring it out during your vacation! Don’t get too close! They are wild animals and need their space and if you get too close, they’ll fly away or hide in their burrows. Let your zoom do its work and you can always crop photos when editing them later. Try to visit some of the recommended spots in the morning or evening for the best light. This is also the time of day that puffins tend to be more likely to be standing near their burrows. Check the weather forecast so you know what to expect and are appropriately prepared, especially if it is raining and you need to protect your equipment. Don’t forget to get photos from different angles and different types of shots. Options to consider include tightly zoomed in so the puffin fills the frame, shots of puffins flying, zoomed out, shots of groups of puffins, etc. Shooting puffins flying is quite hard as they move incredibly quickly once in the air. In our experience, you’ll want to set your camera to continuous shooting, also known as burst, and you might find it easier to set the camera to manual focus. You’ll want a fast shutter speed (at least 1/1000th of a second), and a relatively high f/stop to give you a bit of wiggle room for depth of field – around f/8. Then, take a lot of pictures, and be prepared for lots of out of focus and blurry ones! Puffins form large rafts in the water and these can be fun to photograph. Shots of landing and taking off puffins can also be good from the water. You’ll need to be in a boat for these types of shots. If you take a boat trip, you’ll be shooting from a moving object, so you’ll want to make sure your shutter speed is set high (at least 1/1000th of a second) to compensate for the boat movement. Using a lens with image stabilization is also a good idea. If you want to get a photo of a person and a puffin, our suggestion is to use a long lens to “compress” the image, making the subjects seem closer together. This means the person can be fairly far away but seem closer to the birds than they are, and will disturb the birds less. We’d generally advise shooting with as wide open an aperture as possible to isolate the puffin using a shallow depth of field. Always consider the background though, puffins look good against green grass and blue water. Take some time to observe the puffins. After awhile you’ll notice patterns in their behavior and be able to better predict them, which will better help you be prepared for getting the best shots. Be careful around cliffs and respect warning signs and barriers. These are there both for your protection and for the birds. Be prepared for bad weather. It rains a lot in Iceland and it often goes from sunny to rainy very quickly. Have a waterproof bag, a plastic bag, or proper rain cover with you whenever you are photographing outdoors to protect your gear. Consider lying prone in the ground in some spots when possible. This will help you stabilize your camera and put you on the same level as the puffins. Also, if you remain still, the puffins will get used to you and not scare as easily. Be patient – good wildlife photography requires patience! If you want to increase your photography skills before your trip to Iceland, consider taking a course so you know how to set your camera up properly and compose great photos. 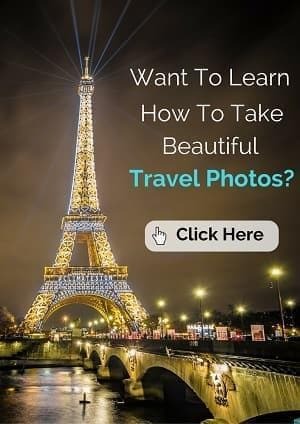 We have a comprehensive online travel photography course – you can learn more and sign up here. So that is the end of our puffin guide! 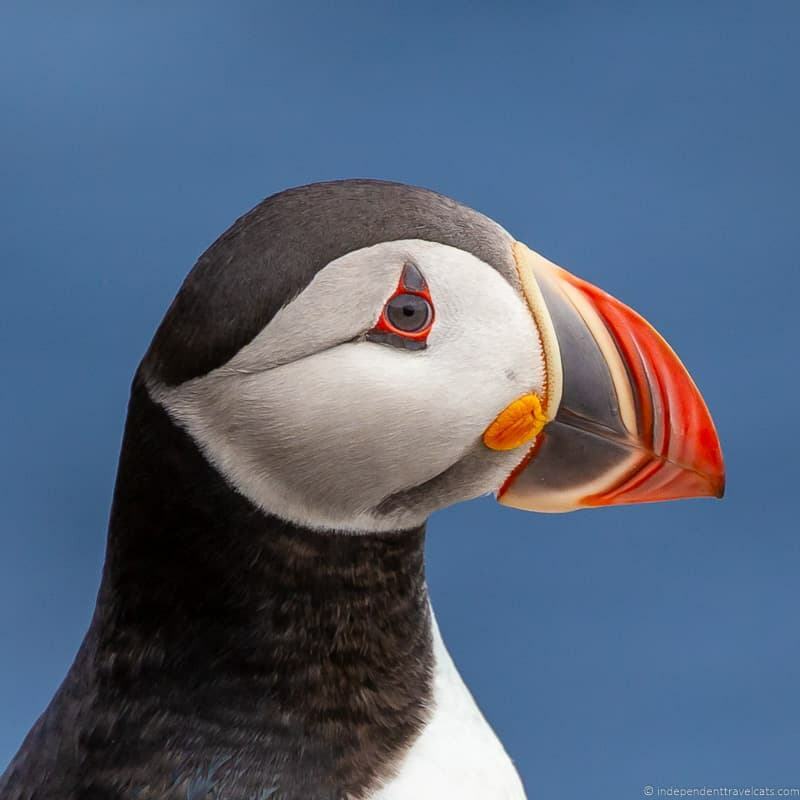 We hope this has helped you learn about the best places to see puffins in Iceland and how to responsibly see and photograph these amazing birds. If you are planning a trip to Iceland, we recommend checking out all our Iceland travel information. Do you want to see puffins in Iceland? Did any of these spots sound appealing? If you have seen puffins, we’d love to hear about where you saw them and your experience at that particular site. If you have any questions about where to see puffins in Iceland, or any other Iceland travel questions, just leave them in the Comments section below and we’ll do our best to answer them! Hi! Thank you for this amazing article about the puffins. It is extremely informative. I was so sad to hear about Toti’s passing. I was hoping to meet him this August. He sounded like an amazing being. I will be staying overnight (with car) in the Westman Islands in early August. My primary reason for going there specifically is to hopefully see puffins. Would you recommend 1) walking or driving around ourselves on the island, 2) taking a land tour on the island, or 3) taking a boat tour for the best chances of seeing puffins? Do you know if the aquarium has other puffins, or was Toti the only one? Lastly, are we likely to see puffins in Dyrhólaey if we don’t drive on…what sounds like… the scary road up, and stay on the road below? Yes, we were lucky to meet Toti. There were 2 other puffins at the aquarium when we visited (we did not see the other 2 as they are not always viewable by public) and I think there were 2 new ones that were rescued this year during the annual Pysjubjörgun (bird rescue) that may still be at the aquarium (Hafdís and Þór). Last I heard there were 3 or 4, but not sure if the rescued ones can be released or not. If you have 1 night on the Westman Islands (Heimaey) then I would plan to drive to the birdwatching shelter at Stórhöfði in the morning or evening as this is one of the best places to see them (or at least has been in past years). I’d get a map from the tourist information office and ask for them to mark the bird shelter for you and they may have other tips as well for this year. I’d also ask about the area around Herjólfsdalur – we hiked out there but didn’t see them, but may not have been in the right area. 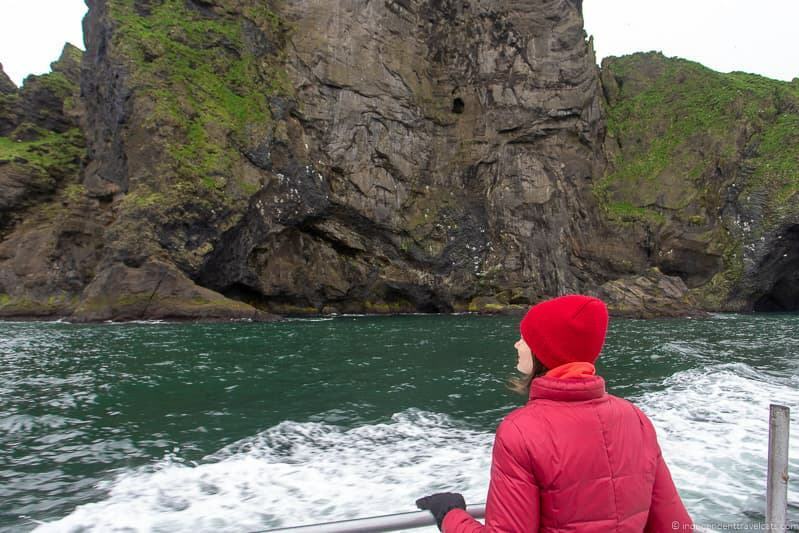 If you have time, a boat trip is a great way to see the island and you’ll likely catch some puffins (and other birds) swimming, flying, and looking for food. We’d recommend booking it in advance. If you don’t have time for a boat trip here, you may want to take one of Akurey or Lundy from Reykjavik as there are quick tours there that allow you see puffins from the water (although obviously at a bit of a distance) such as this one. You can visit most of the museums on Heimaey (including the aquarium) and downtown historical attractions on foot if staying centrally (or by car). Eldheimar, which focuses on the volcanic eruption here, is a highlight. The road at Dyrhólaey should be in decent condition in August (depends on amount of rain) but it is not the best for those who don’t like windy narrow roads. But you can see puffins from the lower area as well and there is a path leading between the two so you can always walk up to the other viewing areas as well. I’d just allow more time to explore to give yourself the best chance to see them. Note that most of our photos were taken with long zoom lens (so they appear close, but we were often a bit of distance from them), so we definitely recommend bringing a pair of binoculars and/or zoom lens to get the best views. Hope that helps and wishing you a great trip to Iceland. Hope to follow your itinerary and see the puffins next year. We have never seen any puffins! It is definitely on our bucket list, they are just so cute. Love your photos. This is a great list, so will save it for when we make it to Iceland. When I visited Iceland, I was not wildlife oriented 🙂 Now I am, and I wanna see these guys. Puffins are so cute! How cute. Seeing the puffins was one thing I missed when I went years ago. Really like that you included a section on responsible sightseeing as that is so important balancing tourism with animal conservation. And awesome shots! I did not know that baby Puffins were called Pufflings – that’s adorable. I would opt for one of those half-day tours to see both Puffins and whales. Such a thorough list of options here, you really did your homework. On the bucket list. Oh, these puffins are adorable! I’ve never seen one in real life, but then I haven’t been in Iceland either. This is a great guide for seeing puffins in Iceland, so I’m going to save it for later. I’m still hoping to go to Iceland someday. In fact we were supposed to go last year, but we ended up in Patagonia instead. No puffins there, though. Thank for your not only suggesting when and where visitors go to see Puffins, but also to remember to respect wildlife in the process. It is great to have the opportunity to experience Puffins, but it is just as important to give them room as well. It was interesting to see how this concept and the effects of climate change have impacted how we interact with Puffins. Museums and other organizations no longer allow you to see them up close, which I think is a good thing when it comes to preservation and respecting animals. It’s something that has crossed my mind the more I visit aquariums, zoos, and other wildlife organizations. Hi Brooke, Glad you enjoyed our articles on where to find and see puffins in Iceland! Yes, being a responsible tourist is definitely important when it comes to viewing wildlife and respecting their environment – we travel a lot and sadly see a lot of people being very inappropriate (scaring animals, trying to touch them) and also doing dangerous things (standing near cliffs). It is sad to see how the puffin populations have been declining in some areas, and hopefully it does not continue as some have predicted. There are likely numerous factors responsible for the decline in puffin numbers, but climate change is definitely one of the bigger factors that most scientists things have caused the decline indirectly (by impacting their food sources). I’ve never even heard of a puffin!!! What a beautiful bird! It’s like a cross between a toucan and a penguin!!! You got some great shots with your zoom lens! Yes, we have puffins in the UK as well, we’ve seen a lot of them here in Scotland. We’re lucky to live not too far from the Scottish Sea Bird Centre, which is a charity and museum dedicated to the local sea birds and wildlife. They operate boat tours in the warmer months to see the birds. 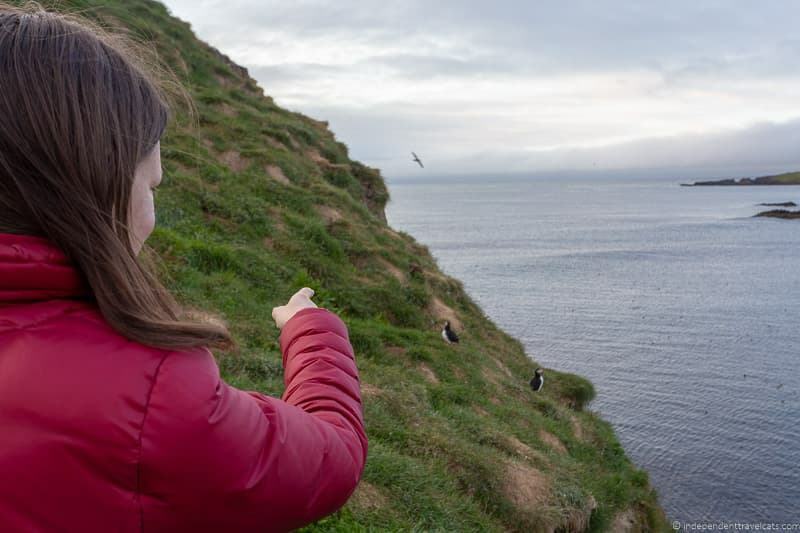 The staff and volunteers at the aquarium on the Westman Islands help rescue a lot of seabirds during the fledgling period as many of the young birds become confused and fly inland, flying into houses and artificial light. Most of these can then be safely re-released but some have injuries or are too young to leave with the rest of the birds, and the staff give them food and a place to live. Some of these can then no longer survive in the wild, so there are normally a few such birds at the aquarium. So it is good they have a chance to live. But I am glad that the museum no longer allows guests to touch the puffins here (as they did in previous years) as I don’t think that was a good idea, and there should definitely be a separation between the birds and visitors. Wow. This is an Awesome Guide. I ended up seeing quite a few puffins while in Iceland myself. Once part of a cruise and a few times near cliffs elsewhere in the country. Definitely a highlight of my times there.